Progress at the construction site of the PETER BENOIT project. 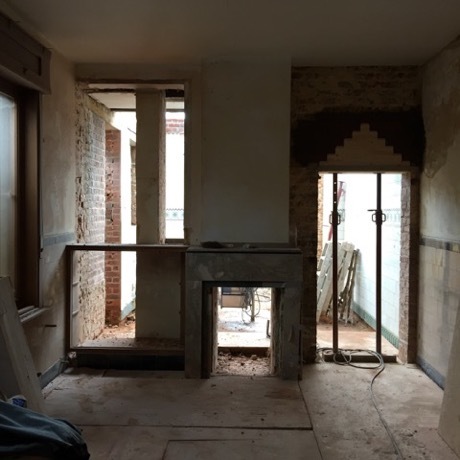 Reconversion of a family house. We'd like to announce that from now on we'll communicate all our news items through our Instagram page. Progress at the construction site of SPADE. A new Kavel project. Empty plots in the city. Initiated by SO-Gent, a social city housing project. Progress at the construction site of KOEKOEK. Reconversion of a house into two family homes. 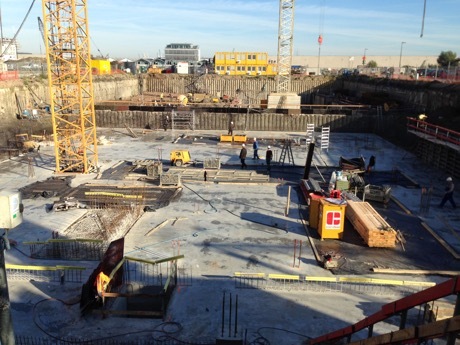 Progress at the construction site of the IJZER project. 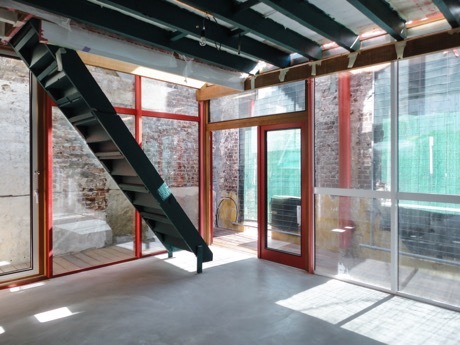 Reconversion of a particular corner building into several studios and an office along the canal in Ghent. Progress at the construction site of the PAUL FREDERICQ project. Progress at the construction site of the FRIANT project. Progress at the construction site of the second phase of the LWWK project. 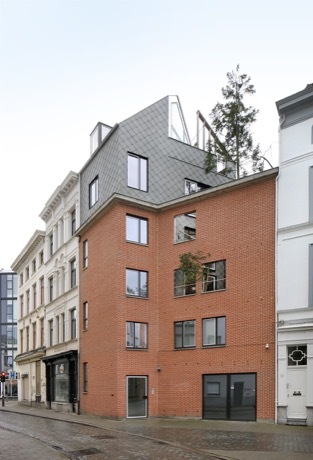 Reconversion of an office building for a law firm in Brussels. With META, NOA & OFFICE KGDVS. 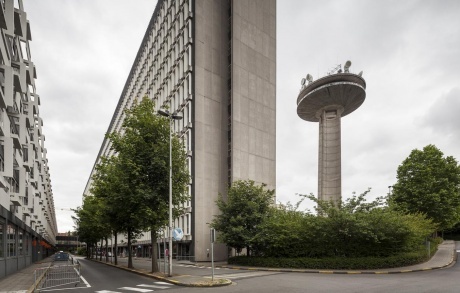 Great photographs by Filip Dujardin! And so much more. A cabinet of lost objects. objects that furnish a room. and hide absent ideas but cover what we all know. Empty details of abstract rooms. 100 Central Street, London, UK. BARBICAN CENTRE Silk Street, London, UK. 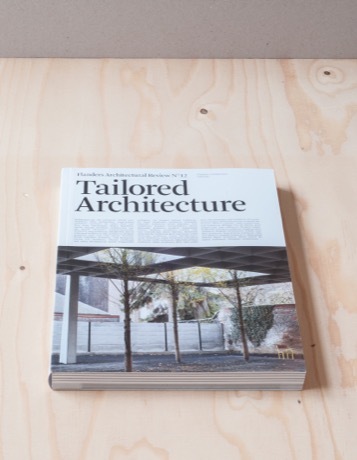 architecten de vylder vinck taillieu is very happy to announce that the latest monograph is now open for pre-order. In collaboration with Archives. Over 300 pages, 17x24 cm, edition of 4000. With Carlos Quintáns and Juan Rodríguez. Archives is a magazine developed for a paper format, as an object one would want to read with both hands and eyes. Its aim is to become an archive that orders and explains the projects and the different ways of working of a series of architects. Image DE VERBRANDE BRUG taken by Juan Rodríguez. 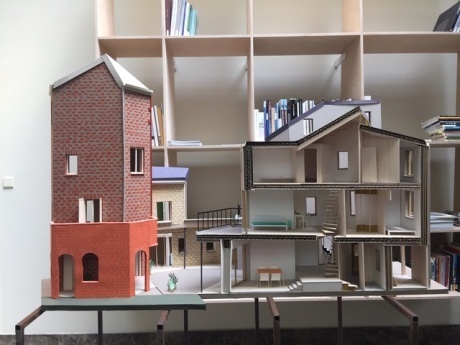 architecten de vylder vinck taillieu, invited to the 16th International Architecture Exhibition - La Biennale di Venezia, curated by Yvonne Farrell and Shelley McNamara is looking forward to the exhibition. MAY 25th - NOVEMBER 11th, 2018, Venice, IT. 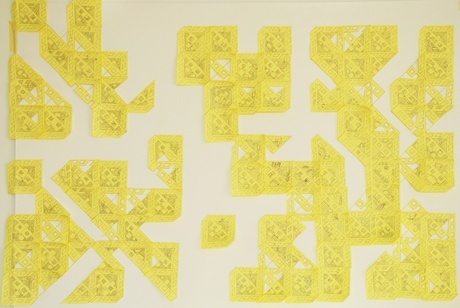 Curated by Amélia Brandão and Rodrigo Costa Lima. The exhibition ranges from the scale of the territory to the one-to-one, pursuing the architect's imaginary. 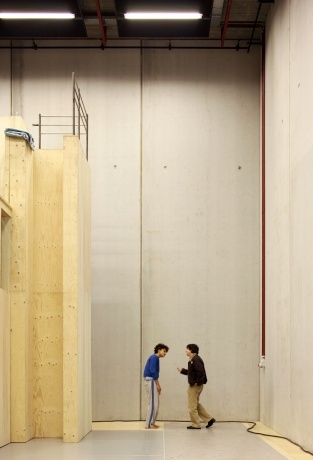 Building Stories shows achievements, turning points or simply notes and desires from architecten de vylder vinck taillieu, Maio and Ricardo Bak Gordon are shown as live expressions of a much larger universe. The exhibition thus establishes a conversation between these architects who - despite each having their own ideas, methods and formal expression - share architecture as a common ground, weaving their individual and unique approaches together. Praça do Império, 1449-003 Lisboa, PT. 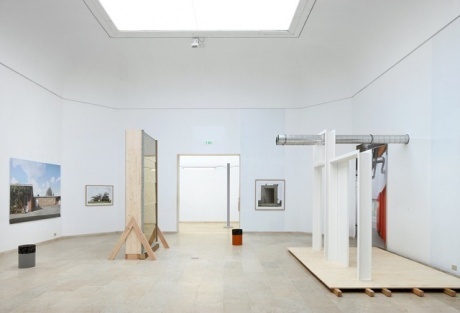 Curated by Fredi Fischli and Niels Olsen. Swiss Institute is delighted to announce the third edition of its Architecture and Design Series, entitled READYMADES BELONG TO EVERYONE. This marks the inaugural exhibition at SI's new home in the heart of the East Village, located at 38 St Marks Pl. 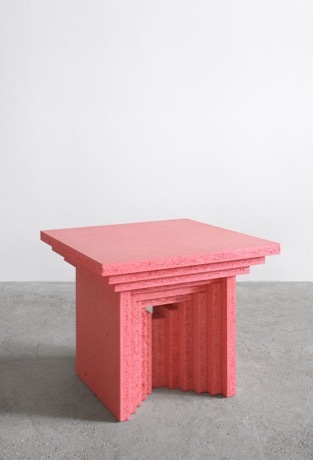 Curated by Niels Olsen and Fredi Fischli, directors of exhibitions in the Institute for the History and Theory of Architecture (gta) at the Swiss Federal Institute of Technology (ETH) in Zürich, READYMADES BELONG TO EVERYONE features more than 50 artists, architects and collectives from 16 countries with 17 new commissions. The exhibition extends contemporary understandings of the readymade, as it has filtered through histories of art, design and architecture to become mutated, redoubled, and accelerated in urban environments of commerce and control. 38 St. Marks PI, 10003 New York, USA. Inge Vinck has been appointed external examiner at the UNIVERSITY OF CAMBRIDGE - department of architecture for the next three years. Starting with 2018 portfolio review June 14 - 15th. 22/05/2018 - UNLESS EVER PEOPLE stay updated! architecten de vylder vinck taillieu is proud to announce that we're participating in the 16th international architecture exhibition FREESPACE. Venice, Italy. At the invitation of curators Yvonne Farrell and Shelley McNamara. 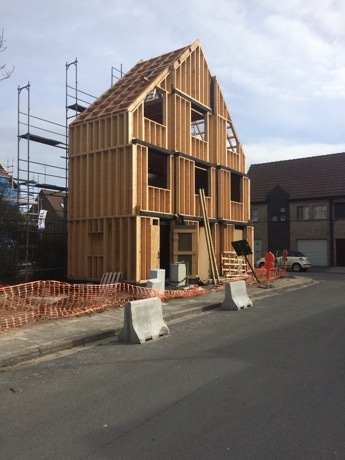 Shipments will start January 11, 2018.
architecten de vylder vinck taillieu is proud to announce the KAPELLEVELD project in Ternat (BE) is almost finished. A new take on elderly housing. With receding corridors giving scale to the building within, and receding façades giving scale to the context around. With care. For Teck & Partners. With Pascal De Muynck, BM Engineering, Bureau Bouwtechniek. The building application for PADDENBROEK has been approved. An educational centre in the countryside of Gooik (BE). 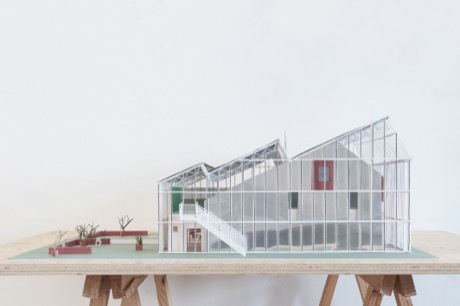 A greenhouse structure covers a former farmstead, opening the building towards the landscape as well as providing a covered outdoor space to enjoy nature. Historical elements are preserved as layers of meaning, for the building, for the site, for Gooik. For Paddenbroek vzw. With Pascal De Muynck and Daidalos-Peutz. 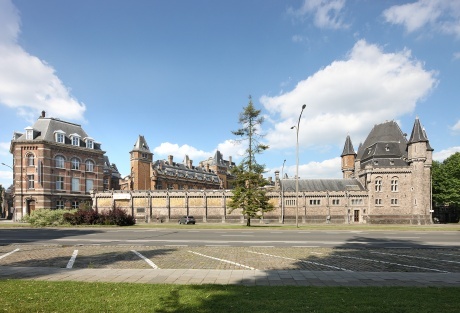 The execution plans for Palais des Expos Charleroi (BE) have been finished. The refurbishment of an exposition building. The building complex as a bridge between the upper and the lower city, by opening up the central building as a public passage and square. In collaboration with AgwA, DOORZON interieurarchitecten & Denis Dujardin. With Greisch, Daidalos-Peutz, Delta GC and Universoil. Competition curated by Charleroi Bouwmeester. For the city of Charleroi, Igretec and FEDEX. 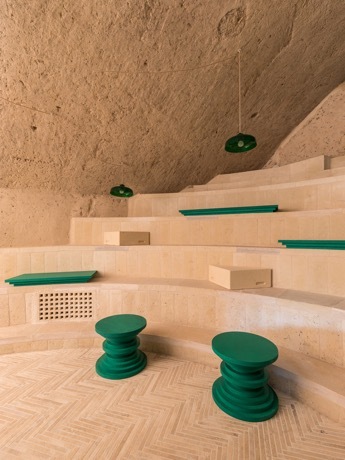 architecten de vylder vinck taillieu just finished Enoteca dai Tosi in Matera (IT). A refurbishment of a typical cave dwelling into a winery. The new staircases as reflections of the old vaults, with stairs to sit on, to show on, to drink on. The stones of Matera, as if it had always been like this. With Michele Andrisani, Andrea Bortolot and PS design consultancy. Photograph by Delfino Sisto Legnani. 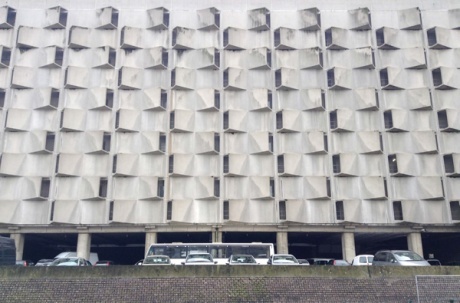 New photographs of ENGHIEN by Filip Dujardin. 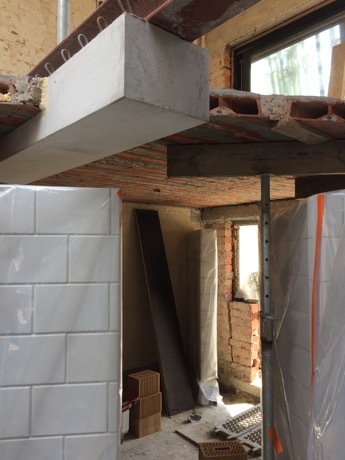 The refurbishment of a typical row house in Edingen (BE). With annexes at the back, now opened up to give the rooms to the garden again, and inviting the garden into the house. The first phase of the LWWK project is finished. 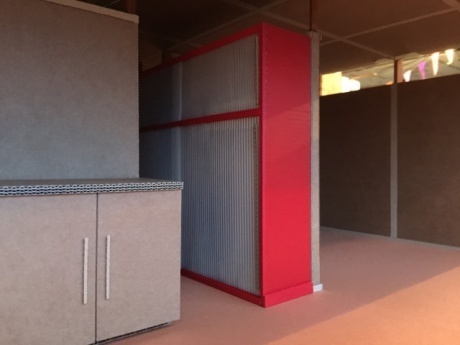 New offices and meeting rooms for a Brussels based law firm. With wall paintings by Benoit Van Innis. With Studiebureau Boydens, Studieburo Mouton and Daidalos-Peutz. 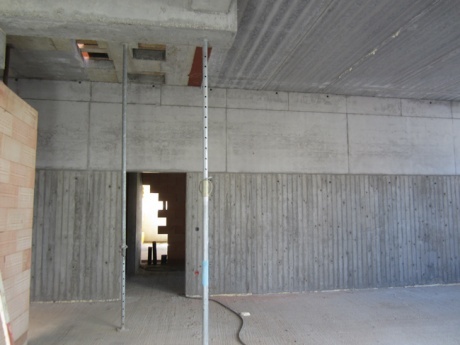 The refurbishment and transformation of an existing building in Münich. 45 apartments. The reinterpretation of architectural elements found in the street – bay windows, roof windows and colours. 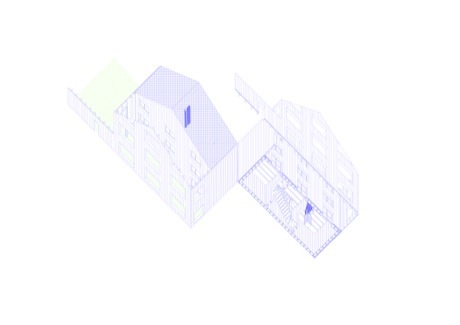 The refurbishment as a dialogue with the existing. As a continuation of the existing. As a transformation of the existing. International competition proposal for EUROBODEN in Munich (DE). Competition proposal SAINT DENIS in Paris (FR). A new housing block. 24 apartments and parking space. 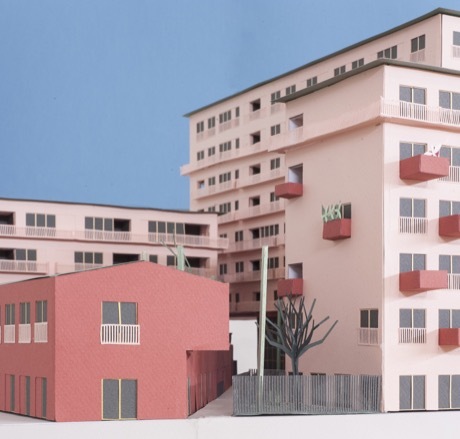 In collaboration with Patrice Mottini Architecte DPLG Urbaniste. 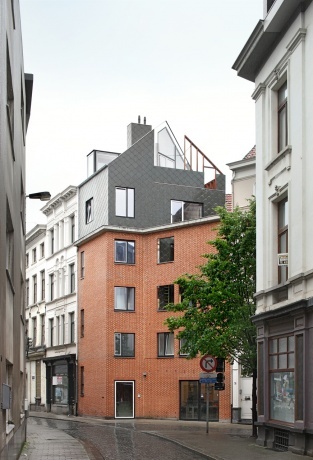 Competition proposal for François Gaystraat, Brussels (BE). 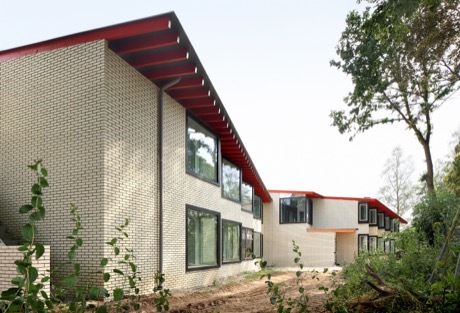 A new housing block of 30 apartments, offices, parking space and day care centre for children. Curated by Brusselse Gewestelijke Huisvestingsmaatschappij. In collaboration with DOORZON interieurarchitecten, BAST, Bollinger + Grohmann & PERITAS. 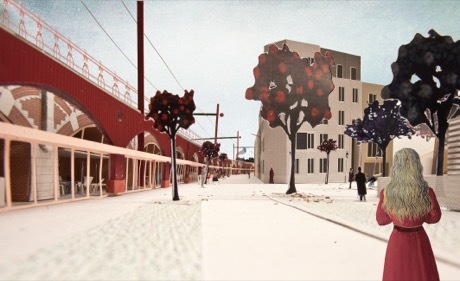 Competition proposal for WISSELSPOOR in Leuven (BE). New housing blocks and a day care centre for children. The opening up of the traditional city block of 71 apartments. A courtyard garden as meeting place for its inhabitants, extending over the roofs, as well as a public passage for the city. Architecture as a means of making the city. Competition curated by AG Stadsontwikkeling Leuven. In collaboration with AgwA, Bollinger + Grohmann, Ingenium, Daidalos-Peutz & Denis Dujardin. Competition proposal for the refurbishment of an existing villa as well as the construction of a new building, for a school in Antwerp (BE). The school as a cosmos, as a world in itself, as a place to discover the world while growing up. A collection of fragments, giving scale, difference and perspective on the world outside. In collaboration with HP Engineers and Sileghem & Partners. Competition proposal for HFBK, Hamburg (DE). 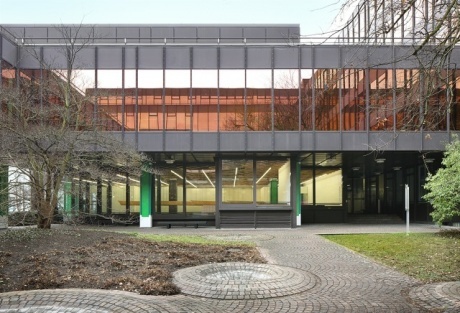 Refurbishment and new building for Hochschule für Bildende Kunste. Atelier. Schüle. Bau. 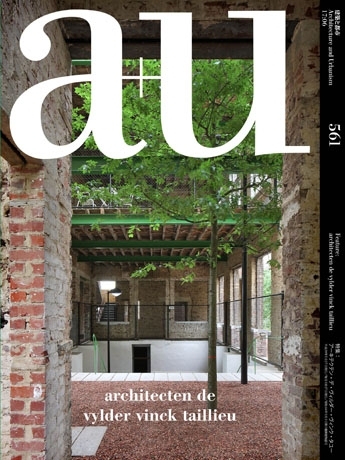 architecten de vylder vinck taillieu is proud to announce that the A+U monograph is now available. A collection of recent projects, small and large, with essays by Lieven De Cauter, Gideon Boie and Angela Pang and Seng Kuan. 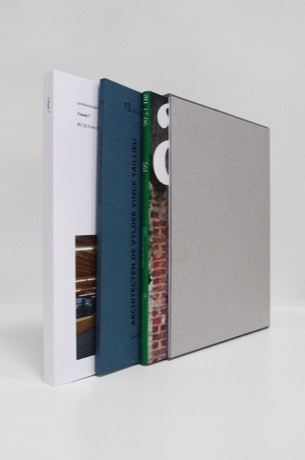 architecten de vylder vinck taillieu will release a limited edition triptych with three monographs: 2G + De Aedibus + A+U. Edition of 53 copies. architecten de vylder vinck taillieu is happy to announce the publication of a new monograph with INDEXNEWSPAPER in collaboration with MODAL. 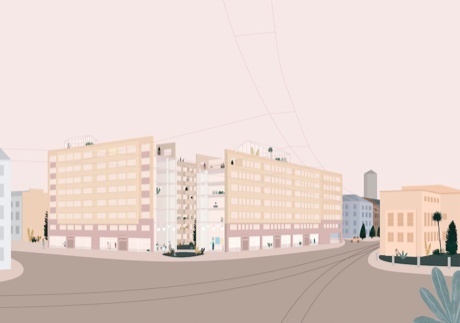 The monograph focuses solely on housing and shows 21 projects, old and new. With Elsbeth Ronner, Job Floris and, Martina Tattara. With Office Kersten Geers David Van Severen, Philip Urpsrung, Alexandre Thierot and Moritz Küng. With Abertura, Sami, Pascal Flammer, Almoco, Arquitectura G, Aires Mateus, Premio Marres arquitectura and Alvaro Siza. 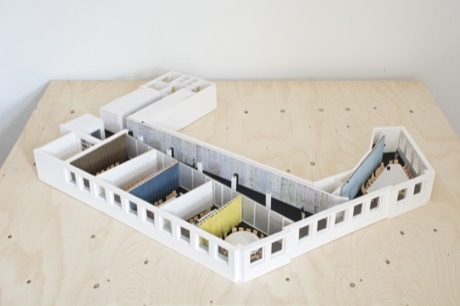 Studio architecten de vylder vinck taillieu announces studio CUT CONSTRUCT CONCEIVE. Cut out’s from drawings and pictures are the starting point. 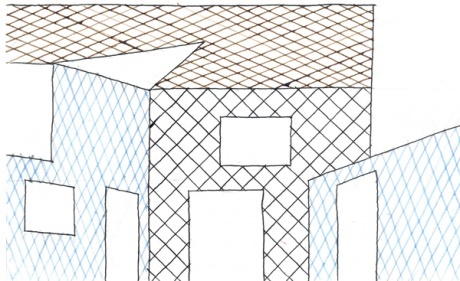 Drawings of never realized houses will be the starting point for the exercises. 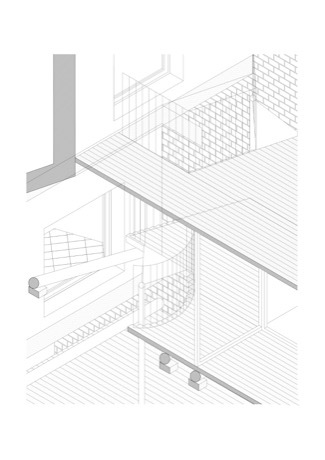 CUT CONSTRUCT CONCEIVE starts from the corner detail to find back in the final project all materiality not as an additive but as a fundament of the space; and the studio NEVER EVER YOURS – school year 2015-2016 - aimed the same idea starting from drawings and models of never realized projects; the difference in this studio - school year 2016-2017 - as it is called CUT CONSTRUCT CONCEIVE is the imagination since it is about cut out’s it is even more challenging. Even being challenged by more than one cut out. Brussels to Ostend. Two times seven totally different venues in two different cities. Your practice will be a Belgian practice. LIVE MEET PLAY SUPER POWER MOVE LEARN is a studio that believes that cities are made by architecture rather then by city planning. So it believes that when good buildings - read: programs - are placed in a good relations - but also distance - towards each other, all together they might set out a new community. Community is identity. Identity means architecture. 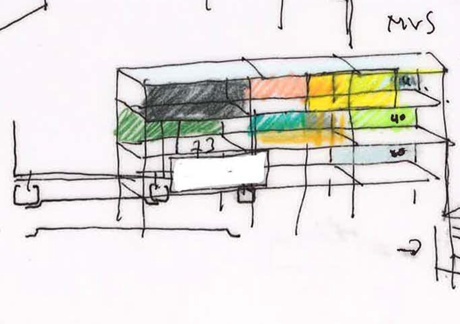 The studio will point out thirteen spots on this long long long venue along the Kapuzinerberg where each student will select seven spots from to set out seven different programs to achieve that idea of new community and identity. Each of the seven programs will differ from size, from seven times one thousand square metres to one thousand square metres divided by seven. All projects will be worked out at scale one to two hundred but only two at scale one to ten, as all the other projects on a scale in between. Seven different themes for the program will be delivered as also twice seven adequate suggestions to fulfill those themes. 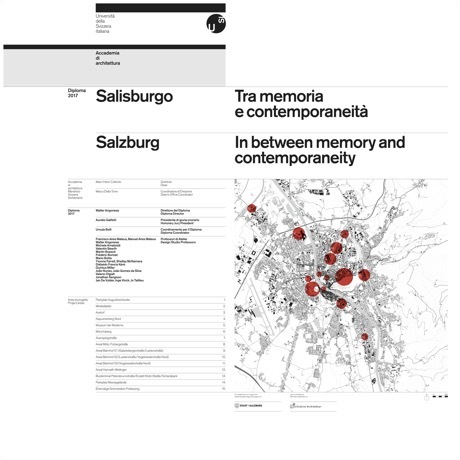 “In between memory and contemporaneity” might be interpreted here as the question of how this 20th century development of small and long land seems to have grew without any friction or position towards the historical perspective of Salzburg as also on the other hand it seems to have delivered self-referential architecture, never reflecting on a possible long lasting idea upon architecture. Today every building seems to be only the expression of itself. We are not looking for a new history, neither a formal set of rules, even not the idea of a new modernity as such. But a wider idea then just seven buildings. What can be the difference. So that this idea on playing chess with seven pieces left to change the whole game ensures that “in between memory and contemporaneity” makes LIVE MEET PLAY SUPER POWER MOVE LEARN different then yet only good positions also architecture ready for a future past. To reconsider what is not expected to be reconsidered. This is what THE SAME THE DIFFERENT stands for. 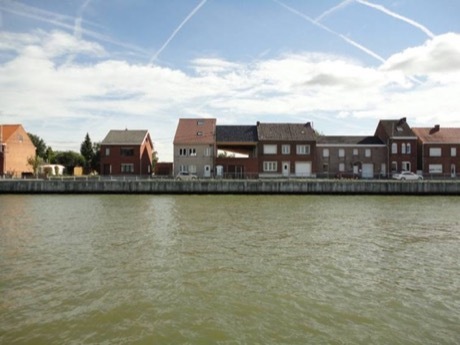 The city of Ghent launches numerous projects for its city using its own developer SOGent. One of these is the KAVEL project. The city buys up property and divides these sites into smaller plots, which can be bought at low prices by young families. The condition is that these families build their homes with architects listed by the city. A better architecture for a better price. An ambition without precedent. And yet, one can ask the question. Even so, how small and how low the cost may be, is the cost still not too high, because the expectation is still too high? Too high in measure? Too high in demand? As if below that measure and below that demand nothing could be possible anymore. One cannot believe that. One should not believe that. THE SAME THE DIFFERENT reconsiders the exercise of the KAVEL project of SOGent. Every past and future site will be reconsidered in light of a different measure and a different demand. Maybe even lower ones, but precisely so a completely different life. A STUDIO on and for the city. The starting point is the house. Or, the houses. 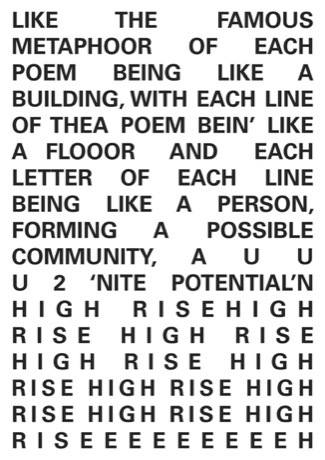 To build the city as such. An unexpected result is expected. In architecture. In urbanism. In life. 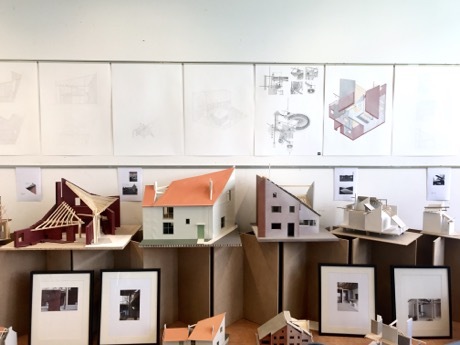 Exhibition of students work, realized by the students in atelier de vylder vinck tailleu during the spring semester 2017 in the Accademia di Architettura di Mendrisio. In Castelfranco Veneto, there is a castle, a house, a court, a studio. 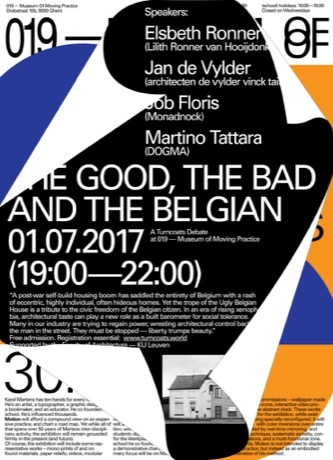 Exhibition of the master studio by Jan De Vylder and Jo Taillieu at KU Leuven, Faculty of Architecture, campus Sint-Lucas Ghent. THE SAME THE DIFFERENT reconsiders the exercise of the KAVEL project of SOGent. Every past and future site will be reconsidered in light of a different measure and a different demand. Maybe even lower ones, but precisely so a completely different life. 48 Pages is a series of books edited by Marco Della Torre and Bruno Pedretti through Academy Press of Accademia di architettura di Mendrisio, Switzerland. 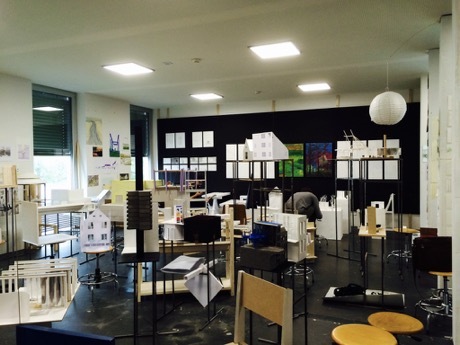 This series collects thoughts and texts concerning teaching and practicing as an architect. the parallelism between the work of an architect and the product of young students of architecture throughout the way of teaching of the professor. 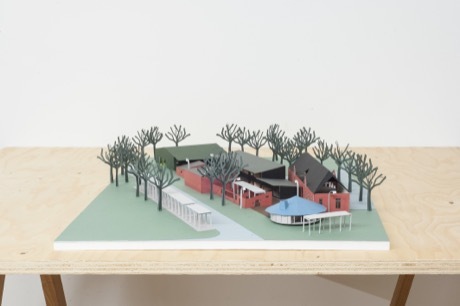 architecten de vylder vinck taillieu will contribute to the annual HORST festival for arts & music in Horst (BE). 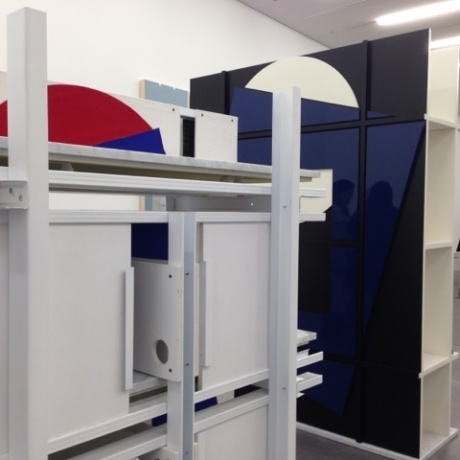 A series of installations titled PODIUM PILE PAVILION as perspective on the context of Horst, giving a context to the festival as well. 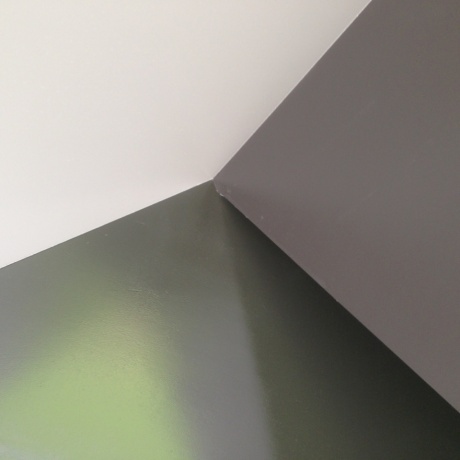 The context of the installation and the installation of context. 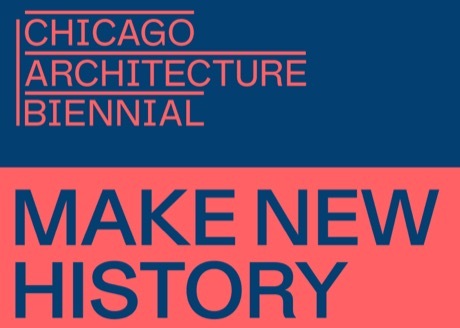 architecten de vylder vinck taillieu has been invited to contribute to the CHICAGO ARCHITECTURE BIENNIAL 2017, Chicago (US). 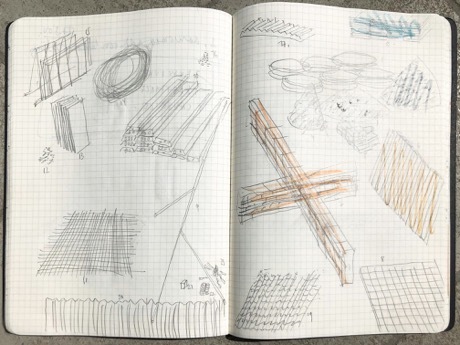 architecten de vylder vinck taillieu will develop a new series of columns, beams and other objects to change the existing perception of the spaces. On the other hand abstract drawings will be made on specific surfaces or corners to reveal an idea on the real construction behind. DECORS AND CONSTRUCTIONS aims to give perspective on some simple ideas on architecture seemingly opposite even though fundamental at any time. architecten de vylder vinck taillieu participated in the exhibition VERLOREN ONTWERPEN (LOST DESIGNS) at Z33 in Hasselt (BE). 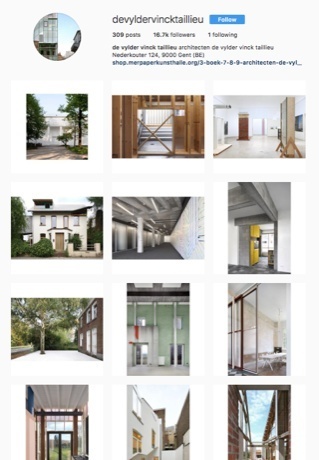 Follow architecten de vylder vinck taillieu on Instagram for a daily feed of photographs, drawings & models. architecten de vylder vinck taillieu wishes you all the best for 2017.
architecten de vylder vinck taillieu is honoured to receive the SCHELLING ARCHITEKTURPREIZE 2016. 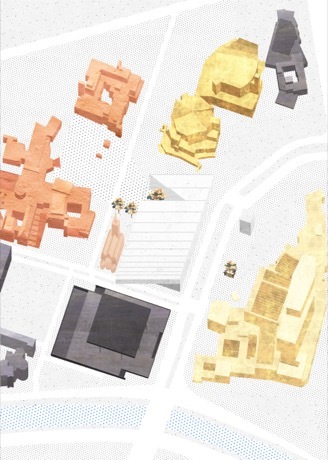 Architecture may be understood as a culturally interacting discipline in which socioeconomic, technical and political processes are brought together. Architecture functions in this way as a medium for social integration, encompassing the all too often neglected cultural relevance of the built environment. The contemporary focus of the Schelling Architecture Awards is grounded in this wider understanding of architecture. What is the role played by differing spatial concepts? How can architecture call attention to the socially relevant themes of this century and create new spaces that are relevant to changes in society as a whole? Architecture as a medium for involvement. The prize winners deliver original contributions to a wideranging debate. 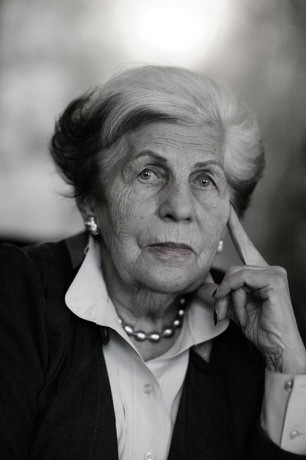 In 1992, Trude Schelling-Karrer (1919-2009), architect and widow of the architect Erich Schelling (1904-1986), established the Schelling Architecture Foundation. She was guided by the architectural historian Heinrich Klotz (1935-1999), founder of the German Architecture Museum in Frankfurt and later of the ZKM in Karlsruhe. Since then, the foundation has awarded prizes for architecture and for architectural theory every two years. An international, varying jury adjudicates. Previous winners are, among others, Peter Zumthor, Kazuyo Sejima, Lacaton & Vasal, Wang Shu and Diébédo Francis Kéré. Previous winners of the prize for architectural theory are, among others, Juhani Pallasmaa and Kenneth Frampton. The SCHELLING ARCHITEKTURPREIZE ARCHITECTURAL THEORY 2016 goes to the British-Canadian journalist and author Doug Saunders. Looking back on a nice collaboration with KOEN DEPREZ, KRIS COREMANS, BASbvba, RCR, DAIDALOS-PEUTZ & BB for the design of a new church in Etterbeek. 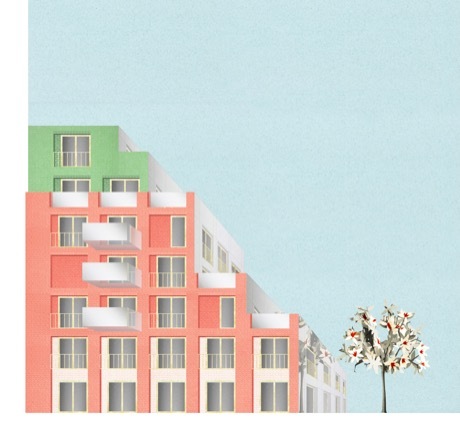 Handed in the proposal for Fierensblok in Antwerp. 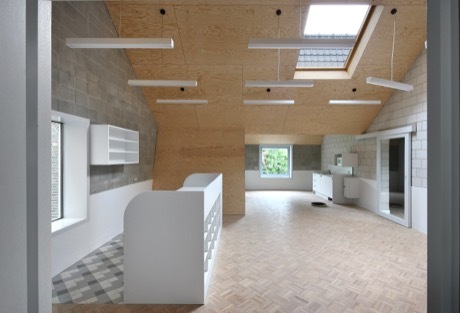 Together with BRANDLHUBER+, DOORZON INTERIEURARCHITECTEN, BARBARA VAN DER WEE ARCHITECTS, UTIL & BAST. Progress of the Cadix building in Antwerp. 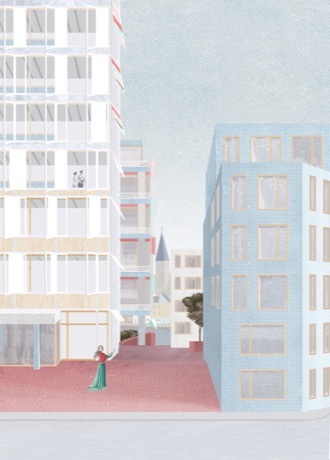 Housing block together with META, NOA, OFFICE KGDVS and PROJECT2. Ukkel’s new child care center is almost ready for it’s new inhabitants. New photographs by Filip Dujardin. 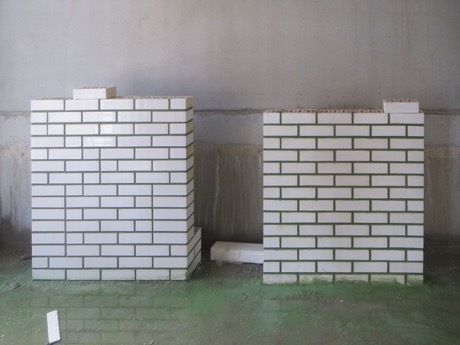 Project initiated by team VLAAMS BOUWMEESTER. One house for two families, Leefdaal is delivered. 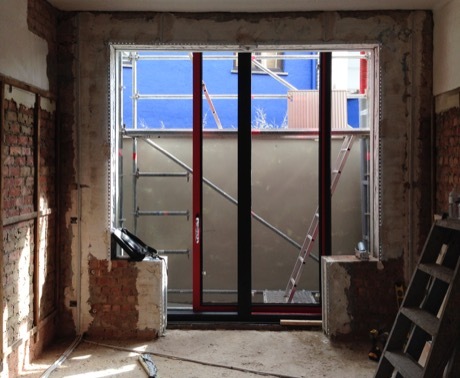 Extensions and refurbishment of a big house. A pergola, logia & veranda. Reconversion for a jewellery store in the city of Kortrijk. 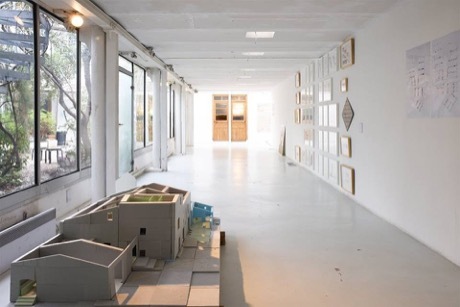 A house with a warehouse becomes a store with an apartment. 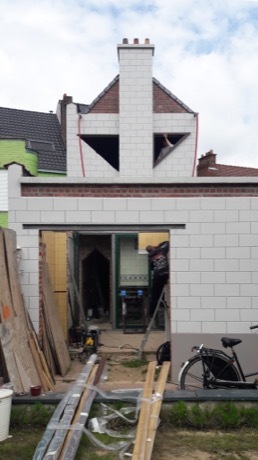 Reconversion of a garage into a house. The first floor is overlooking the canal. De verbrande brug is delivered. In collaboration with DOORZON INTERIEURARCHITECTEN. We’re finishing the last details of house Visserij. 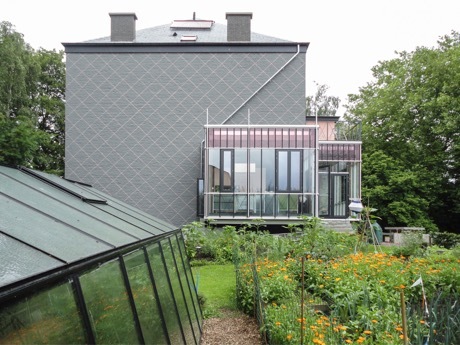 Reconversion into a garden house. Freestanding structure inside the old contours of the existing house. Surrounded by outside space. 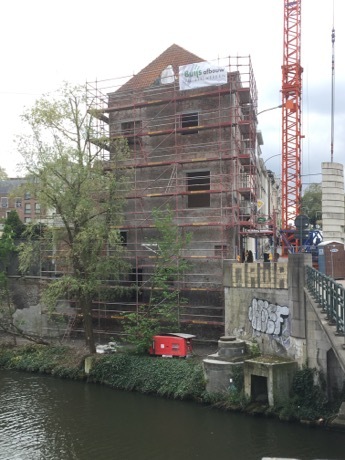 Progress at the STEEN HOUW DIJK project in Bruges. The chimney and the windows. We’re looking back on this nice period of working on the Caritas project. A new future for an old history. Thinking about care in a psychiatric institute. Ateliers, rooms & gardens can be found in the existing abandoned villa on the site. In collaboration with BAVO. Looking forward to start the construction on the KOEKOEK project. 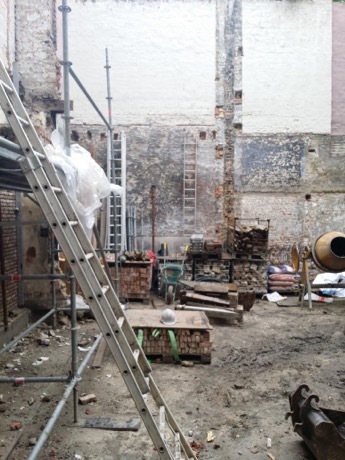 Starting the works on the IJZER project in Ghent soon. 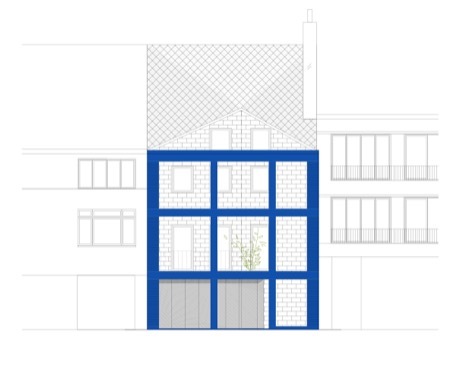 Reconversion of a specific corner building into several studios and an office along the canal in Ghent. Construction works on the FRIANT project will start soon. Building a new facade behind the existing one. 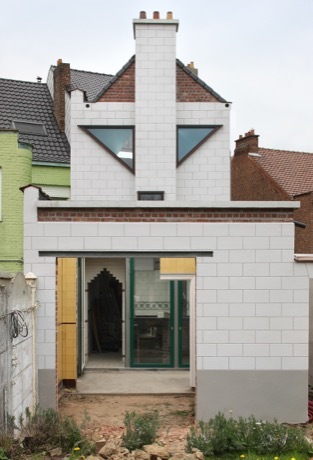 Reconversion of a single family house. The house & it’s side-buildings, the glasshouse & the pond. Currently working on a new Kavel project. Empty plots in the city. Construction works on the LWWK project will start very soon. 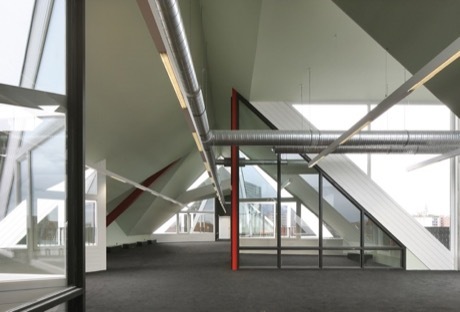 Reconversion of an office building for a law-firm, Brussels. In collaboration with Benoît Van Innis. The Venice summerschool has come to an end. In close and nice collaboration with Riccardo Guglielmi, Matteo Corbellini, Alessandra Pelizzari and Luca Mostarda. 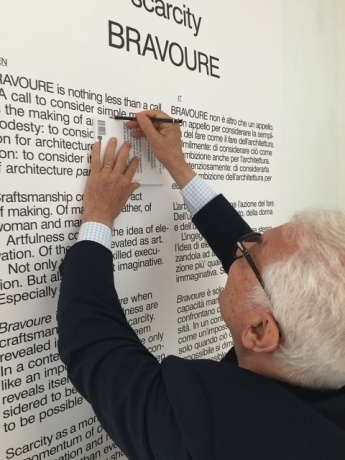 The BRAVOURE book that was released in the occasion of the Belgian Pavilion at the architecture biennial in Venice has been reprinted because of the high demands. 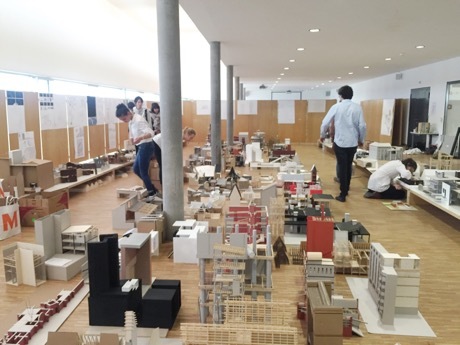 Late August the Flanders Architecture Institute organised Encounters in Optimism: Utopia in a Finite World, an interactive programme of lectures, debates and workshops that took place in various national pavilions at the Venice Architecture Biennale. 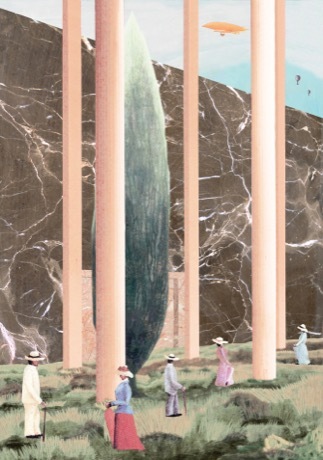 The overarching theme is ‘the architectural utopia in a finite world’. 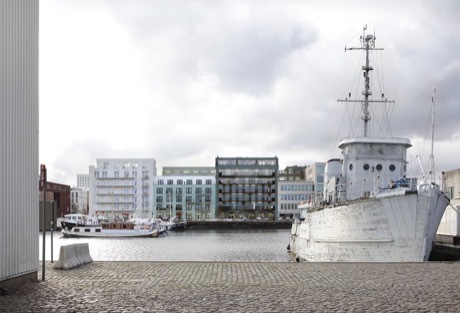 Together withThe British Council, the Deutsches Architekturmuseum and the Creative Industries Fund NL the Flanders Architecture Institute has put together a programme for architects, students and the general public to reflect on how architecture can redefine the city. The economic climate and the idea of utopia are the main topics in these discussions. 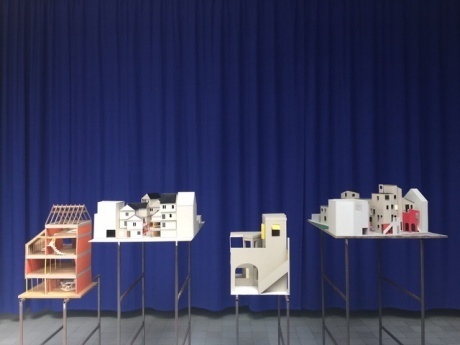 The Flanders Architecture Institute invited several architects to discuss the material making of architecture in relation to the notion of utopia within the context of the messiness of everyday life. This discussion will be used as an elaboration on the exhibition BRAVOURE in the Belgian pavilion. We’re part of the exhibition MAATWERK/MASSWERK. The exhibition MAATWERK/MASSWERK. Custom Made Architecture from Flanders and the Netherlands opens on 7 October 2016 at the German Architecture Museum in Frankfurt. 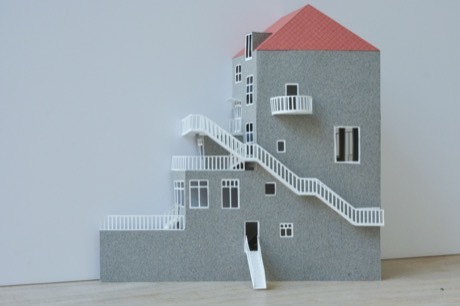 A selection of approximately sixty architectural models places the emphasis on tailored work, precision and craftsmanship as undercurrents in Flemish and Dutch architecture of the past thirty years. We’re very honoured to be invited to take part in the exhibition; In the End; Architecture at the Architekturzentrum in Vienna, Austria. The exhibition sets itself the task of giving an overview of the last 60 years of architectural history, while at the same time taking stock of contemporary tendencies in architecture - pointing out interconnections between past and present. 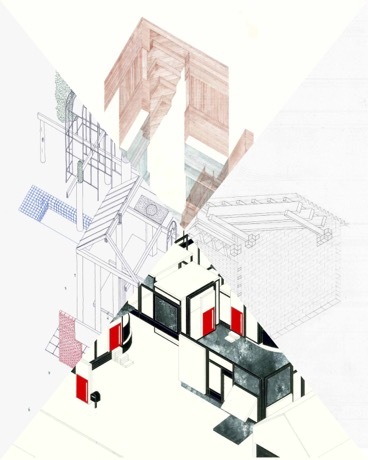 drawings used on poster made in the EPFL studio architecten de vylder vinck taillieu 2015-2016 by Charles Gastaud, Blerta Axhija, Amandine Ischer & Benoît Perrier. 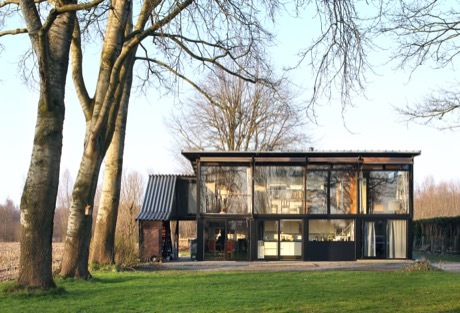 architecten de vylder vinck taillieu is currently looking for an experienced architect & an administrative collaborator. To learn more on how to apply please check here. in between modern and contemporaneity. We are very honoured to be able to say that we are one of the three offices selected by the Board of Trustees for the Schelling Architecture Foundation for its architecture prize. 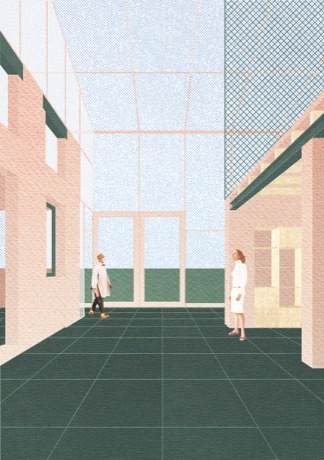 “Flemish architects Jan De Vylder, Inge Vinck, and Jo Taillieu have, in just a few years, created a comprehensive oeuvre that questions quite a few supposed certainties about architecture. 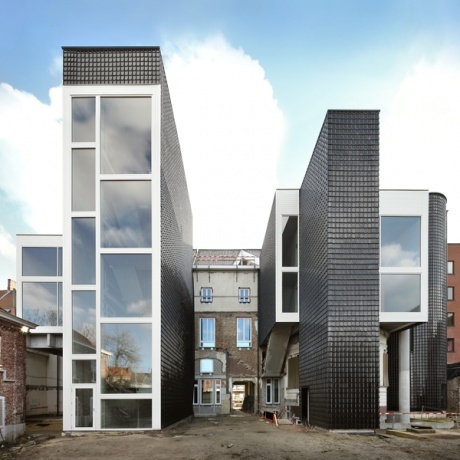 The majority of their buildings are located in Ghent, where the office was founded in 2008: unorthodox and ironic – mostly residential buildings, renovations, and additions, although the firm is increasingly taking on public spaces as well. Their architecture plays with the expectations of the individual viewer, their perceptual habits, and reinterpreting materials. Unfinished elements in their built architectural works are not left by chance; they are the result of a precise design and construction process which, in the architects’ vision, represent one guiding principle above all else: remaining open for change and improvisation as long as possible.” - The Board of Trustees. 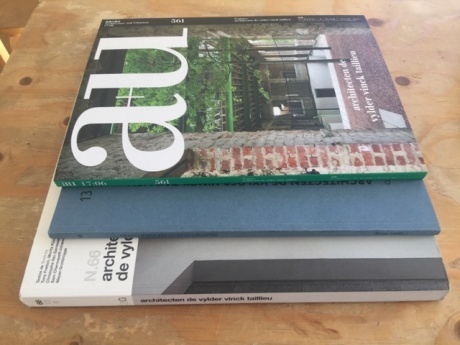 We are very honoured to be able to say that the De Aedibus international 13 architecten de vylder vinck taillieu is now available online and in several bookstores. Looking back on a couple of intense months of collaborating with doorzon interieurarchitecten & Filip Dujardin as team BRAVOURE, with VAI, the invited architects, all the beloved collaborators and everyone involved in this project. Looking back on the amazing opening of the Belgian pavilion at the Venice architecture biennial 2016. Great to see all the people that established this exhibition enjoying the release of pressure. Very proud to be part of this 12th edition of Flanders Architectural Review. 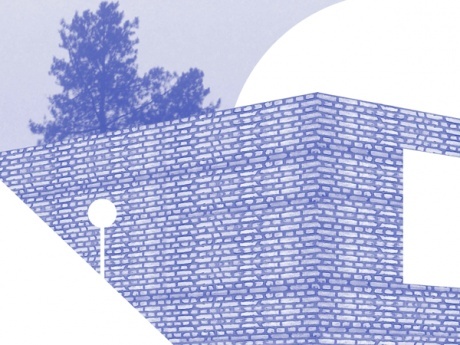 Publication by Flemish architecture institute. How can architecture contribute to society? By delivering projects that are tailor-made, and through designs that reveal a cultural and social purpose. The 118 projects in this edition of the Flanders Architectural Review give shape to this ambition. Together, they tell a story about the role of architecture within a complex European context. 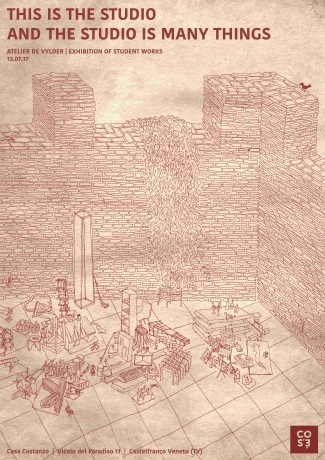 Recent developments in architecture are covered in thirteen essays. 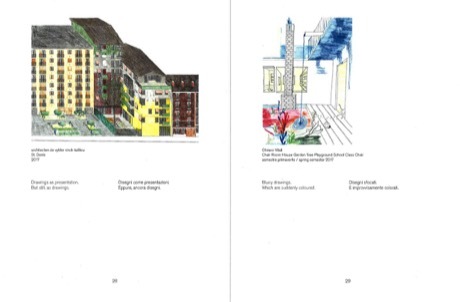 Under four main headings – life, city, scale and form – they deal with contemporary issues regarding communal space, reuse and repurposing, the status of the public domain, and a visual language for large-scale interventions in the city. The quest for typological solutions and formal figures is also discussed. Photographic essays by leading architectural photographers provide an introduction to each theme. President Paolo Barrata 's intervention at the Belgian Pavillion. 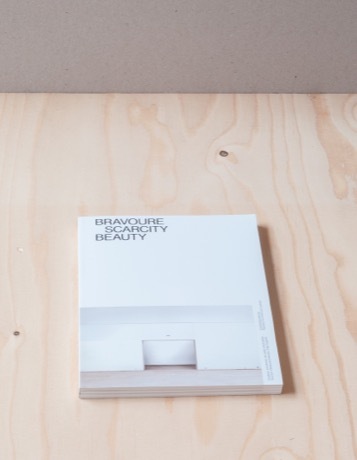 Accompanying publication / catalogue of the BRAVOURE exhibition. Available in the biennale 's official bookstores. Looking forward to the coming exhibition of MANIERA at DESIGN MIAMI/BASEL where MANIERA 05 will be shown alongside other MANIERA collections. Currently working, together with AgwA, doorzon interieurarchitecten, Denis Dujardin, Greisch & Daidalos-Peutz, on the Charleroi Palais des Expositions. 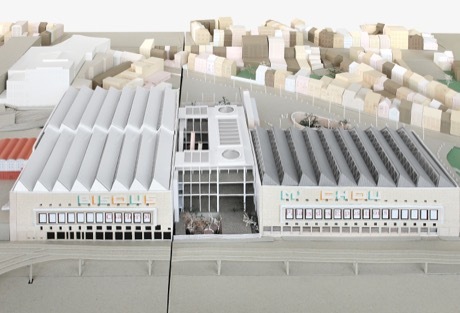 Invited competition, Grand transformation of the existing Palais des Expositions at Charleroi. Project for Igretec and Charleroi Bouwmeester. We are looking back to the STUDIO ARCHITECTEN DE VYLDER VINCK TAILLIEU at the ACCADEMIA DI ARCHITETTURA DI MENDIRSIO (CH) past spring 2016 with pleasure. 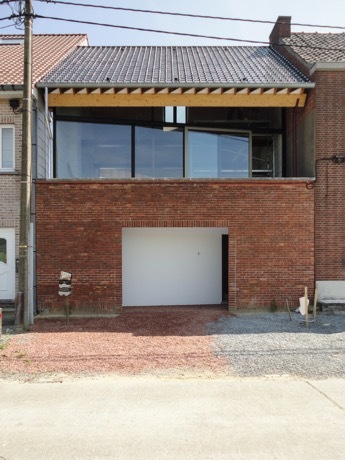 The exercise CHAIR, TABLE, SHELF, BED, YOUR(S) HOUSE(S) framed within the context of BRUSSELS-OSTEND celebrates young architects drawing 2 times 2 pieces of furniture and 2 times 2 houses. Furnitures as backbone of the houses, houses as backbone of life. We are already looking forward to the next STUDIO SPRING 2017. We are looking back to the STUDIO ARCHITECTEN DE VYLDER VINCK TAILLIEU at the EPFL ENAC, Lausanne (CH) past year with pleasure. 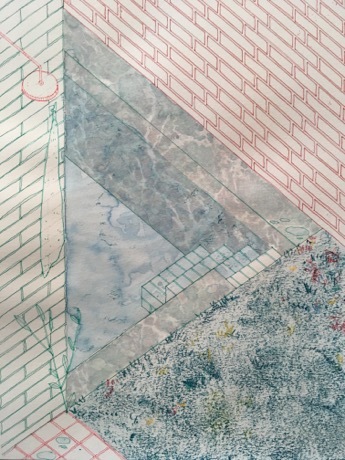 The exercise NEVER EVER YOURS focuses the work of young architects for 2 houses. We are already looking forward to the next STUDIO. There is no - historical - building in Venice that is not the result of a continuous change of tectonic visions - read: cultural changes; read: political changes; read: economical changes - there is no - industrial - building in Marghera that is not the result of continuous change of economical needs - read: economical changes; read: political changes; read: cultural changes. 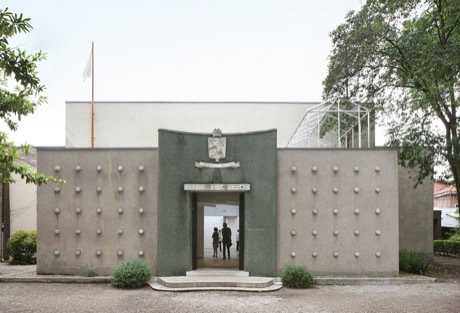 To stay updated about the latest events, news & pictures of the Belgian pavilion at the Venice architect biennial. Go and follow the official facebook page. We are very pleased to give a lecture about the new service center of Ledeberg, Ghent on Sunday 17th of april 2016. This lecture will put the service center in a broader context, in the light of our other projects and for the city of Ghent. It’s our great pleasure to announce the opening of the new service center of Ledeberg. 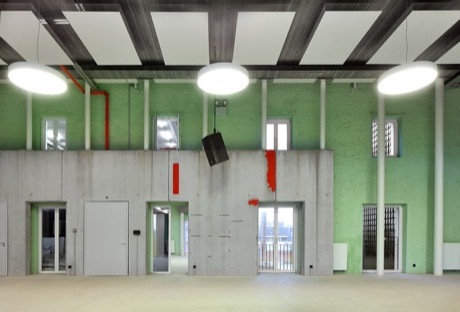 This new center is an outpost for the services of the city of Ghent and holds both civil as police functions. In addition, there’s the large banquet hall, the old wedding hall & the old district court. These three halls are forming the festivities department of the city of Ghent. The project came about after an application and in close collaboration with clients & users. 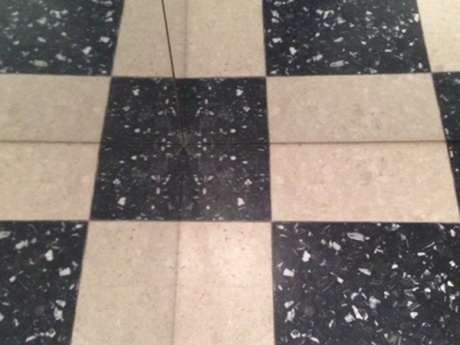 Engineers NEY & PARTNERS and BOYDENS were indispensable in this process. MANIERA commissions architects and artists to develop limited edition furniture series. As architects often have a close relationship with the visual arts and artists are often inspired by the spatial environment, MANIERA intends to crystalize these proximities into new design proposals. More than just furniture, the objects issued by MANIERA are a deliberate search for collisions between the realms of architecture, design and art. We will present a new series of pieces for MANIERA. Alongside of 6A architects, Bas Princen, Christoph Hefti, Office Kersten Geers David Van Severen, Richard Venlet, Studio Anne Holtrop & Bijoy Jain - Studio Mumbai. We are very proud to announce that we, in collaboration with AgwA, DOORZON interieurarchitecten & DENIS DUJARDIN won the competition for Charleroi’s new Palais d’expositions. Curated by the team of Bouwmeester Charleroi & Igretec. Engineers GREISCH & DAIDALOS-PEUTZ are also on the team. 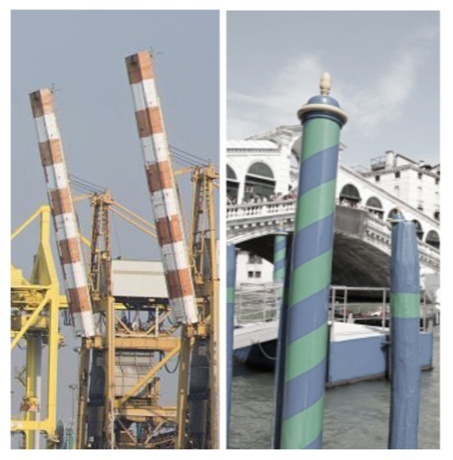 Looking back on the presentation of the competition for CENTERS, Antwerp by AG VESPA. In collaboration with HP ENGINEERING & BASbvba. Looking back on the nice collaboration with Brandlhuber+ on the Berlin MUSEUM FOR THE 20th CENTURY competition. We are looking forward to enter the building phase of the invited competition for KABK Den Haag we’ve won earlier this year. The construction on the KERK project has started. Elderly housing at SINT-KATHARINA LOMBEEK. 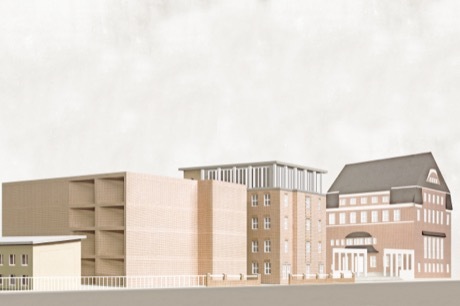 We handed in our proposal for the competition of the new art academy of KDG hogeschool at Campus Markgrave, Antwerp. In collaboration with BAST & UTIL. Our proposal for the new sports center in Waasmunster. In collaboration with AgwA & JZH & partners. Competition for the city of Waasmunster. We are currently working on a visitor center for Paddenbroek. 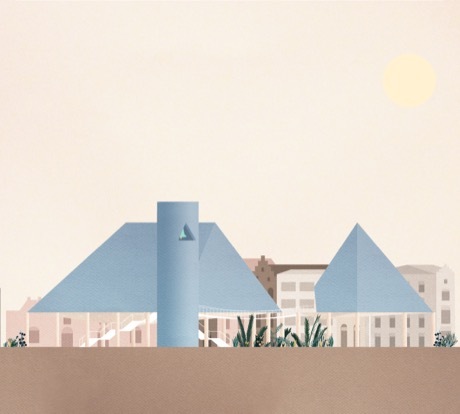 Won competition for the city of Gooik. 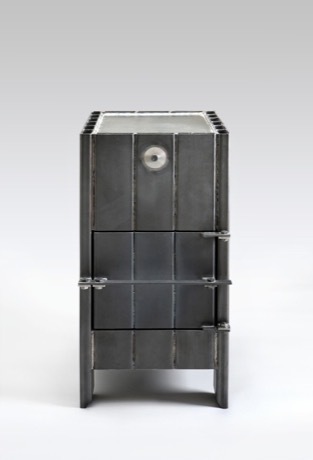 The stove designed by JIJ’S is now available at Weltevree. 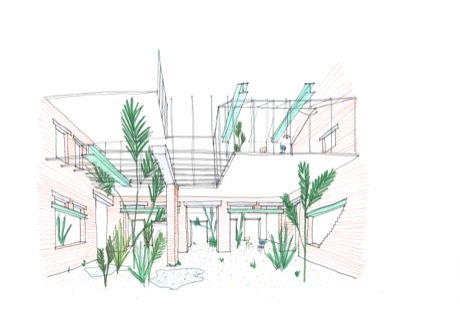 We are very proud to have presented the competition for Lille’s Fac Médecine & Pharmacie. In close collaboration with BEAL & BLANCKAERT, MUTABILIS, EIFFAGE, SOFUM, PRO DEVELOPMENT and ELYNE OLIVIER. 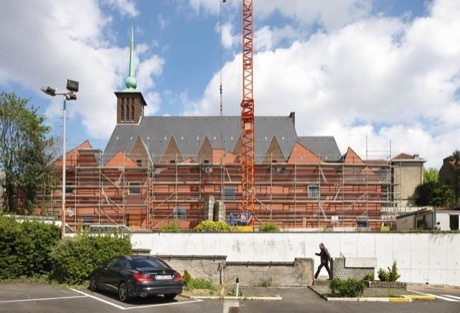 architecten de vylder vinck taillieu will propose a design for the build of a new church in Etterbeek. Together with KOEN DEPREZ, KRIS COREMANS, BASbvba, RCR, DAIDALOS-PEUTZ & BB. 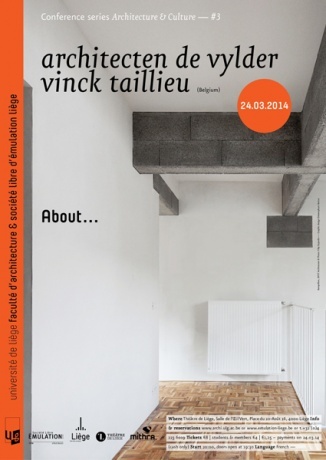 architecten de vylder vinck taillieu is proud to announce a monograph together with DE AEDIBUS, Quart Architectur. Releasing end of May 2016. Looking back on the nice lecture at the Washington University in St. Louis we did on the 1st of April 2O16. Looking back on the lecture in Paris we did the 17th of March 2016. Looking back on the lecture with Gijs Van Vaerenbergh curated by Christophe Grafe at the KAP Forum in Cologne, 7th of April, 2016. Looking back on the lecture at TU Eindhoven 16th of march 2016. 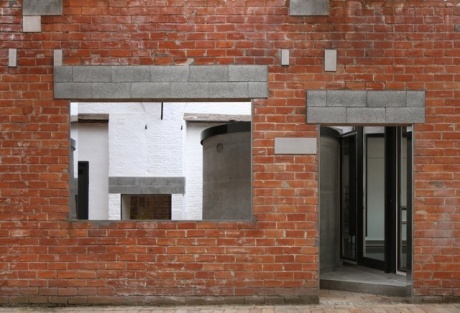 The Flanders Architecture Institute (VAi) commissioned the BRAVOURE team to create an exhibition in the Belgian pavilion at the Biennale Architettura 2016 in Venice on the theme of ‘craftsmanship’. The team, consisting of architecten de vylder vinck taillieu, doorzon interior architects, and architectural photographer and artist Filip Dujardin, explore the question of what craftsmanship can mean in a context of scarcity. In order to demonstrate this, BRAVOURE exhibits fragments of thirteen representative projects of thirteen Flemish architects. BRAVOURE contains contributions from De Smet Vermeulen architecten, Philippe Vander Maren - Richard Venlet, Wim Goes Architectuur, architecten Els Claessens en Tania Vandenbussche, Eagles of Architecture, Jo Van Den Berghe - architect, BURO II & ARCHI+I, Robbrecht en Daem architecten i.s.m. Arch & Teco, OFFICE Kersten Geers David Van Severen, Laura Muyldermans + Atelier Starzak Strebicki, Gijs Van Vaerenbergh and Stéphane Beel Architects. 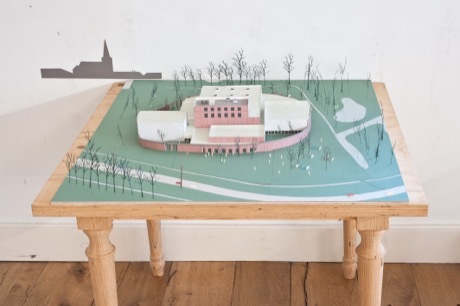 This accompanying publication is a further elaboration of the work exhibited in the pavilion and a contribution to the architectural debate in Flanders and beyond. Comprised out of essays, interviews and images, this book offers an answer to the question what craftsmanship can mean today. The catalogue will be revealed during the vernissage of the pavillion and can be purchased at the official bookshops of the Biennale. 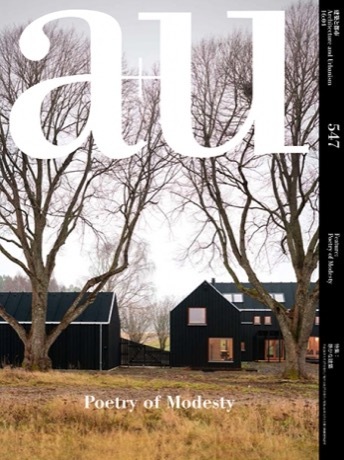 Very excited to be part of the A+U March 2016 publication - Poetry of Modesty. Looking back on the lecture on “théorie de la représentation” at ULB Brussels 9th of march 2016. We are honoured to be involved in the summer architecture workshops in Venice, 27th of June - 15th of July 2016. 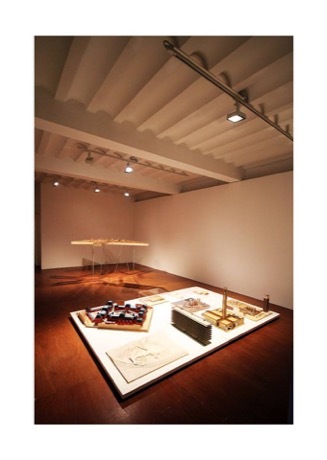 Curated by the University di Venezia. Pleased to announce that the submissions for the tennis re-enactment have successfully found their place in the Chicago Architecture Biennial. 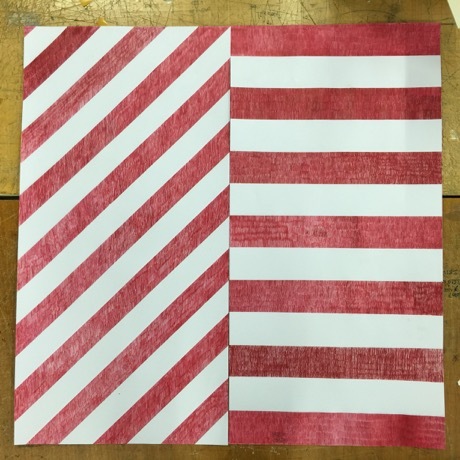 We would like to point that submissions are still more then welcome! 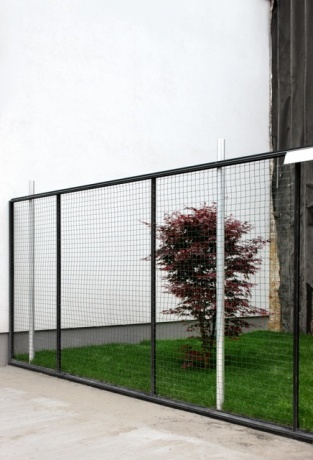 We will add them frequently to the installation in Chicago. The design for the lawyer firm LWWK is finished. 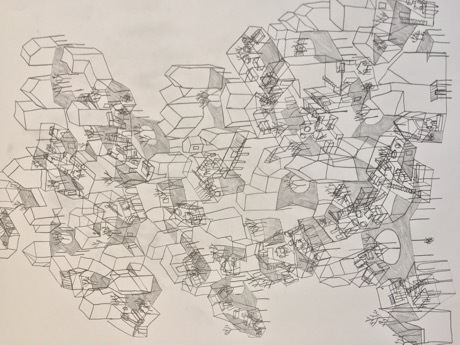 Benoît van Innis is also drawing! Very honoured to be able to invite you for 12x12x12 11 10. Following the residency of architecten de vylder vinck taillieu, last September in the house that René Heyvaert built for his brother Gilbert Heyvaert, architecten de vylder vinck taillieu will show only once the work RéH BOUW RéH STOP RéH ZIEN in the house in the Goudmijnstraat, Destelbergen. Twelve groups of twelve people will be allowed to walk around for twelve minutes in the house being able to watch, at the same time, the models, videos and photos. This will take place on Sunday, October 11th and will start at 14h. You can send an email to reh@architectendvvt.com and you will receive a notice confirming the hour. If you don’t have a lot of time, let us know the hour that you’ve planned on coming over and we will check what we can do. The visits will finish at 17h. A visit which was a visit for you. A visit which was a stay for us. A live in. A thinking. A finding. A search for. A work on. A gratefull stay. HET KABINET is a new initiative that connects the three different campuses - abbey, palace and regie - of the school. But on the other hand also the four different courses - interior architecture, urban planning, architecture, but also the international aspect. HET KABINET shows the unexpected moments that live outside of the school. It brings them inside of the wall and what may happen inside of the school back over that wall. HET KABINET is a wall. Proud to announce to have won the PADDENBROEK competition. Happy to have presented our contribution for the PORTUS GANDA competition. In collaboration with HDSPV and EVR architecten, lining up as team arca ganda! The construction on the CADIX project has started. 07/09/2015 - TENNIS RE-ENACTMENT: deadline extended! The deadline for the submissions of the TENNIS RE-ENACTMENT is extended. You can now submit the videos until the end of biennial (3rd of january). We will frequently add the videos to the installation in Chicago. Looking back to this nice summer school sessions in June in which our own work was launched as starting point for an exercise on change dealing with context. 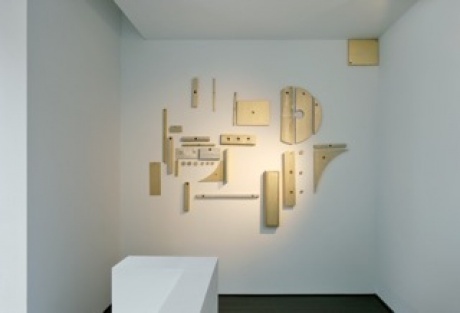 Happy to invite you for the opening of the solo-exhibition OHNMIT of ANTE TIMMERMANS at BE-PART PLATFORM VOOR ACTUELE KUNST, Waregem for which architecten de vylder vinck taillieu invented a decor for the artist ANTE TIMMERANS as for the existing building designed by Frank Delmulle. Happy to announce to have won the competition for PC CARITAS in Melle. Regarding a new future for an old history of one of the villa houses on the site, challenging a possible rethinking of care. 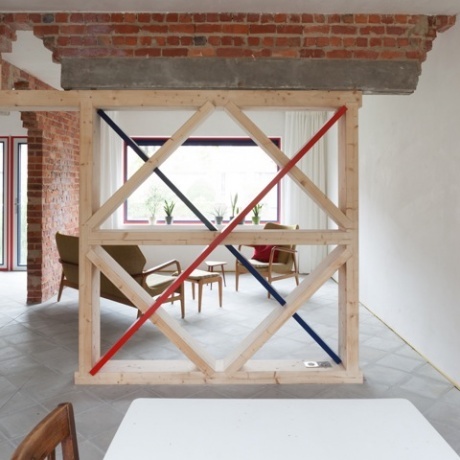 September this year architecten de vylder vinck taillieu will be resident at the HEYVAERT residence with the projects RéH BOUW RéH STOP and RéH ZIEN. 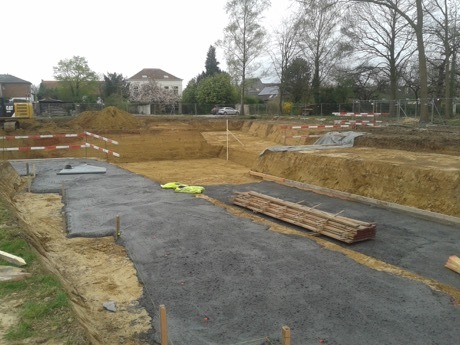 The project for the house ENGHIEN entered the rough building phase. Looking forward for the windows. The project WIVINA is heading for the delivery. Looking forward for the first inhabitants. The owners have moved in! 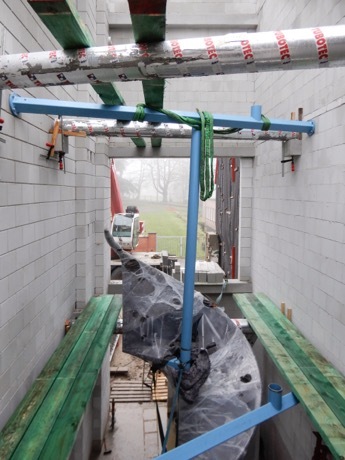 The project for the OCMW of Aarschot is heading for the delivery. Looking forward for the first inhabitants. And looking back on such a nice experience to work with DRDH architects together on this project. Thanks! 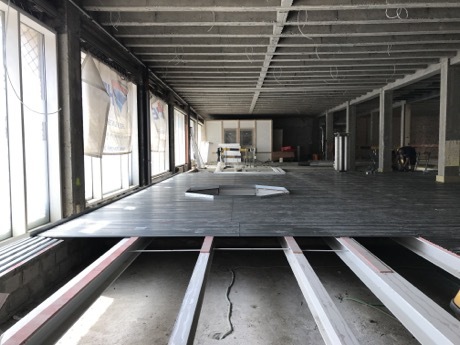 The project KRAAKJE is heading for the next building phase, technics and finishing. 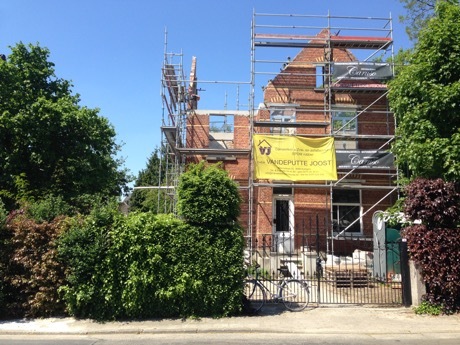 The project for the house VERBRANDE BRUG is heading for the end of the rough building phase. Looking forward for the windows. 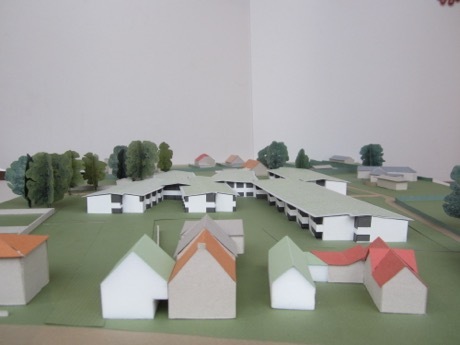 The project for elderly housing at SINT-KATHARINA LOMBEEK is heading for the tendering. We are looking forward to the STUDIO ARCHITECTEN DE VYLDER VINCK TAILLIEU at the ACCADEMIA DI ARCHITECTTURA DI MENDRISIO (CH) spring 2016. 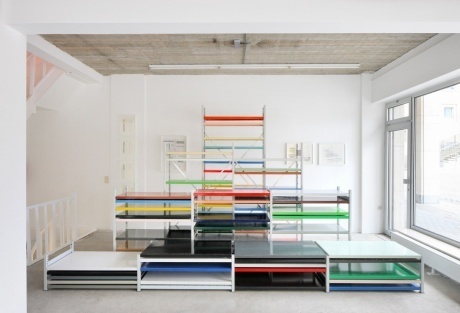 The exersice CHAIR HOUSE TABLE BED HOUSE SHELF exists from the imagination of the detail and then finds, along Brussels and Ostend, the world of the living. We are looking forward to the first semester of the exercise NEVER EVER YOURS / CORNER CASCADE COMPLEXITY at the EPFLA ENAC LAUSANNE (CH). From observation to imagination; from detail to architecture. In the on going setting of the interventions at the exhibition space of the gta at ETH Zurich. Happy to invite this BOOK FOR ARCHITECTS show and being part of this. 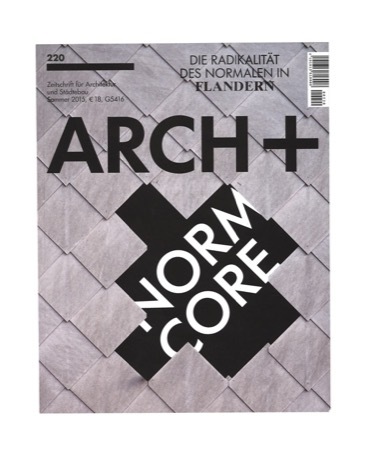 Looking back to the lecture at the KW institute for Contempory Art in Berlin August 12th on the occasion of the publication on Flemisch Architecture DIE RADIKALITAT DES NORMALEN IN FLANDERN special of ARCH+ Zeitschrift für Architectur und Städtebau. In close collaboration with VAi Flemisch Architecture institute. Looking forward to lecture October 28th on our recent work and on our going thoughts. 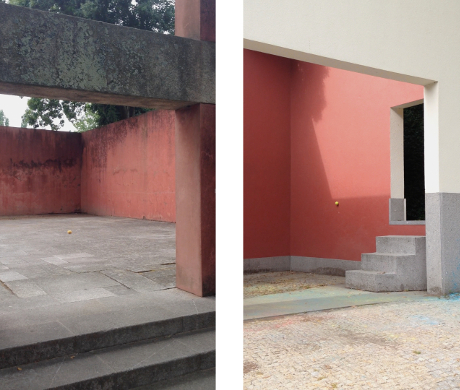 Last summer in the frame the presence of architecten de vylder vinck taillieu at the summer school at the Porto Academy a visit was brought to Quinta Da Conceiçao park in which Tavora interfered in many ways. Small interventions. 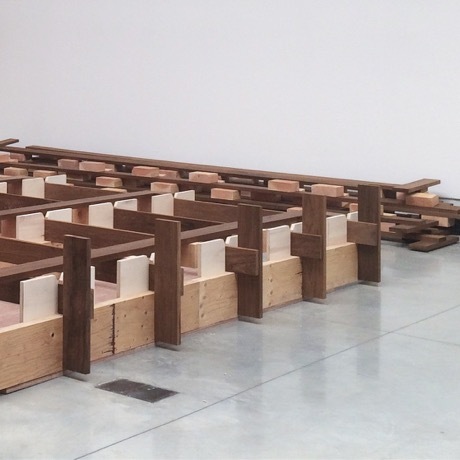 Large interventions. A tennis court. A monumental entrance space. Some staircases. All kind. And so beautiful. As architecten de vylder vinck taillieu is invited at the Chicago Architecture Biennale 2015 and the title of the biennale is “The state of the Art of Architecture”; the friction architecten de vylder vinck taillieu will bring to that theme is the demand of the daily regarding the ambitions architecture rather likes to stand for. What is the meaning of the art of architecture in the perspective of daily life? 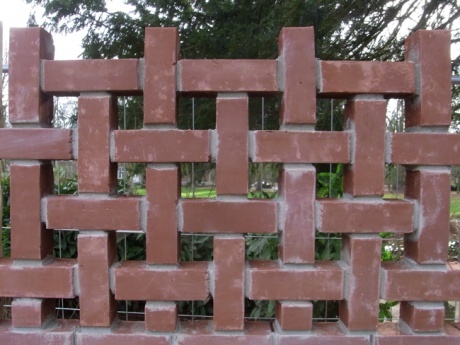 Is there a possible constraint or is that constraint only seemingly? The tennis re-enactment is the project that will give that moment of reflection a possible décor. 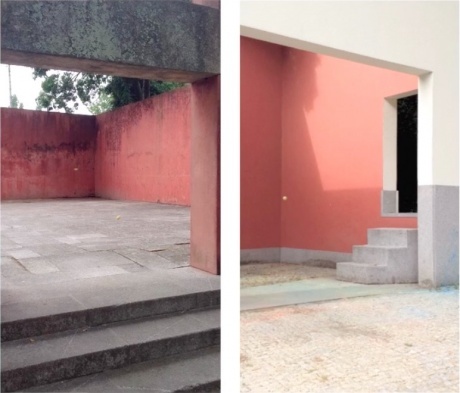 Following that experience at Toavora’s Quinta De Conceiçao park architecten de vylder vinck taillieu set up with the students of the Porto Academy summer school a small re-enactment series of playing tennis at many other places dealing with the status of architecture. 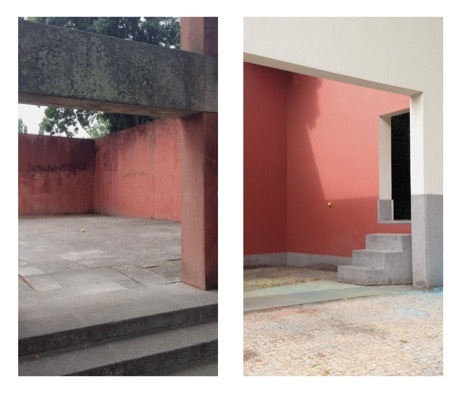 At the entrance of the Porto School Alvaro Siza designed a kind like outdoors room as Tavora designed for the park; a room specifically being a tribute to Tavora. The first re-enactment happened to be at that room. 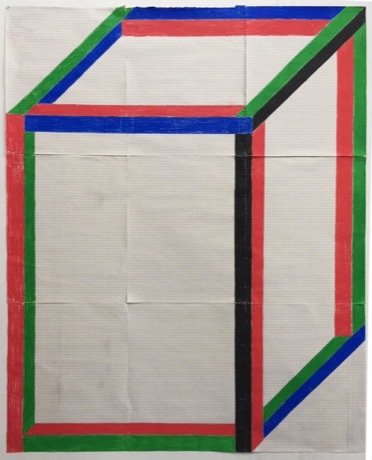 On February 27th the group-exhibition RE-MADE, curated by Geert Van Doorsselaere and Hugo Meert, has opened at the old post-office in Halle. 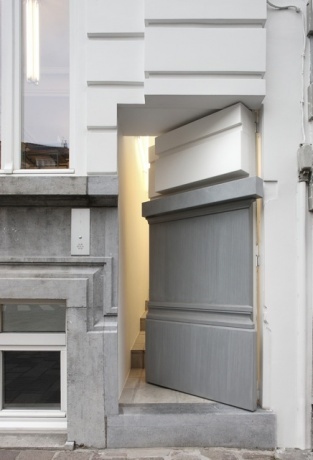 The reconstruction of a corner is the contribution of architecten de vylder vinck taillieu. We are happy to be present next to Caroline Andrin, Kaspar Hamacher, Myung Joo Kim, Christian Gonzenbach, Chloe Daval, Laura Durandeux, Anne Lenaerts, Fred Biesmans, Sofi Van Saltbommel, Hannes Van Severen, Francine Van der Biest, Eric Chevalier and Gordon Matta-Clarck. 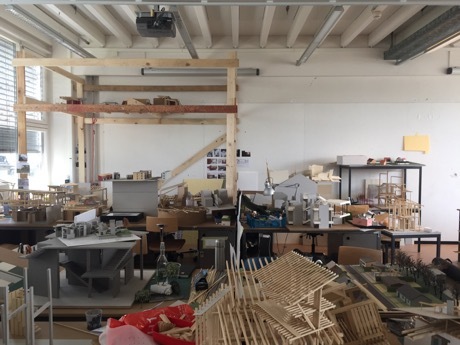 With pleasure we look back to STUDIO ARCHITECTEN DE VYLDER VINCK TAILLIEU that took place last fall 2014 at ACCADEMIA DI ARCHITETTURA DI MENDRISIO (CH). The exercise TWICE A HOUSE TWICE A DETAIL started from the imagination of the detail and found its way along Brussels and Oostende to the world of housing. 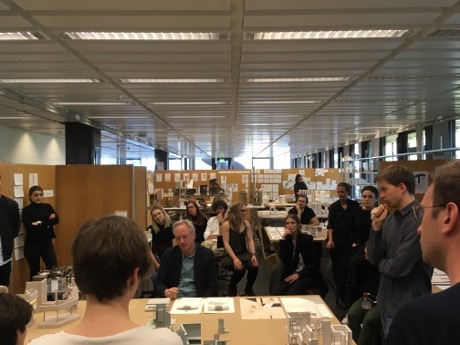 With pleasure we look back to the first semester of the exercise CORNER CASCADE COMPLEXITY and forward to the results in the second semester of our STUDIO ARCHITECTEN DE VYLDER VINCK TAILLIEU at the EPFLA ENAC LAUSANNE. 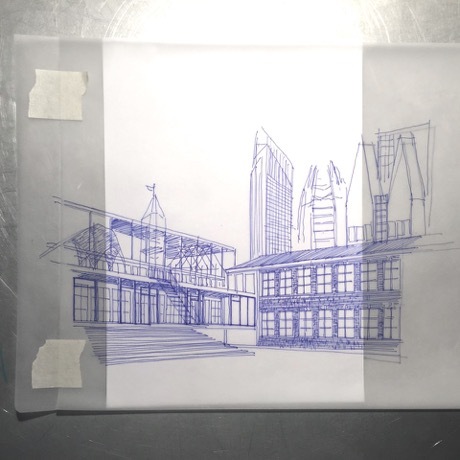 From observation to imagination; from detail to architecture. 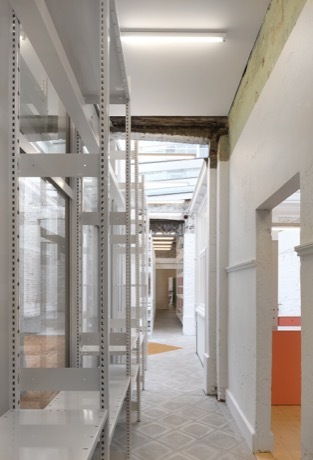 With pleasure we are looking forward towards the results of the studio 45 & 65 and the special exercise SPITS at the KUL FACULTY OF ARCHITECTURE CAMPUS GENT AND BRUSSELS. 7 HOUSES 1 HOUSE for the last time - exercise called 65; the BACHELORTEST - and FIRE FIRE FIRE - exercise 45; a study of a historical house that results in a design of the same house at the same place, but different, after a small fire -. The exercise SPITS will surprise KUL with a masterplan for the campus Gent. 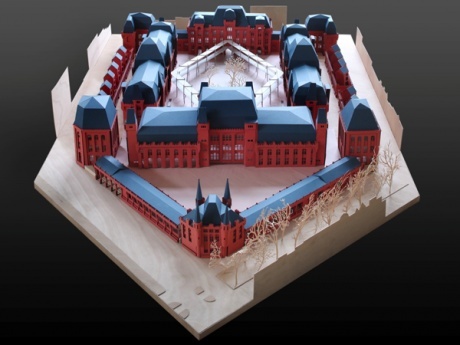 Together with our partners of the team KATTEN* we look back to a nice collaboration for the competition by the FLEMISH GOVERNMENT ARCHITECT for the NEW PROVINCIAL ADMINISTRATIVE CENTRE in the former LEOPOLD BARRACKS at the CITADELPARK in GHENT. This collaboration has lead to a constructive negotiation with the client, the PROVINCE of EAST-FLANDERS, in the light of the realization of our proposal for their NEW PROVINCIAL CENTRE. On February 28 the PROVINCE of EAST-FLANDERS decided to stop the negotiation in favor of a market operation. End of story. * evr-Architecten; Doorzon Interieurarchitecten; Barbara Vanderwee architecten; Rotor; Filip Dujardin; Dennis Dujardin Landschapsarchitect; VK engineering. 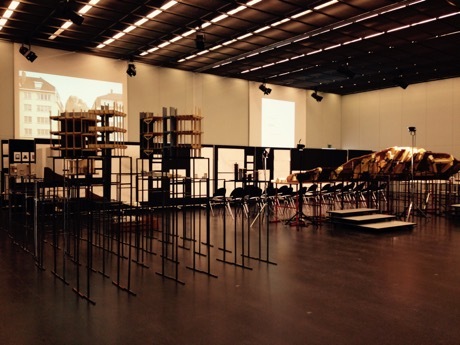 We are happy to announce the opening of our exhibition called CARROUSEL at ETH/gta EXHIBITIONS in Zurich (CH). The exhibition on our work is represented by seven interventions in the exhibition space and by the invitation of almost twenty-seven guests. 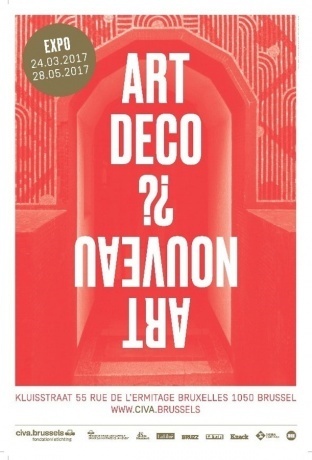 Niels Olsen & Fredi Fischli invited and curated this exhibition. 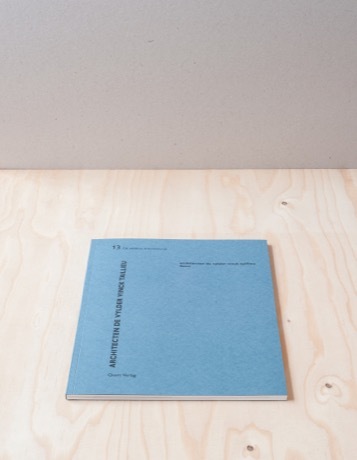 On the occasion of the exhibition CARROUSEL at ETH/gta a special book set is launched. This book set is a combination of the reprint of 1 boek 1 architecten de vylder vinck taillieu, a 2G architecten de vylder vinck taillieu, a book titled Marcel including the proposal for 'het Broodthaerskabinet' at S.M.A.K. in Ghent. 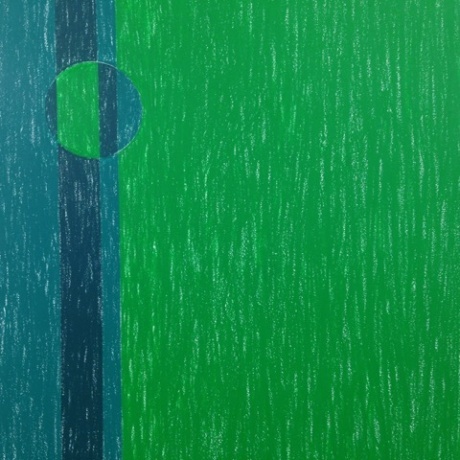 This set of three books comes together with the brochure on the exhibition and a set of three green pencils. 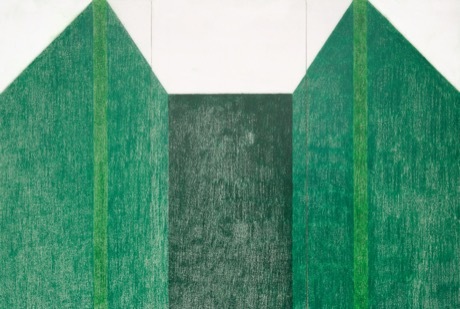 Those green pencils are the pencils used to make one of the interventions in the exhibition. Available at ETH/gta from the 10th of March and later on at our favourite bookshop Copyright. This book set has only 150 copies. 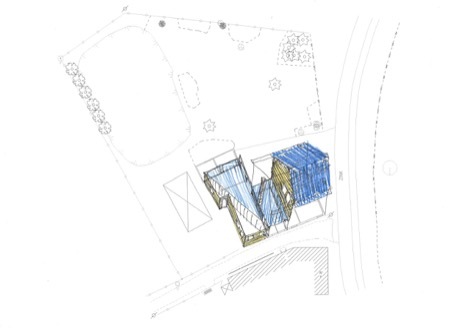 Shortlisted for this invited competition for a new representative building; we are looking forward to present the worked out sketch submitted in February. 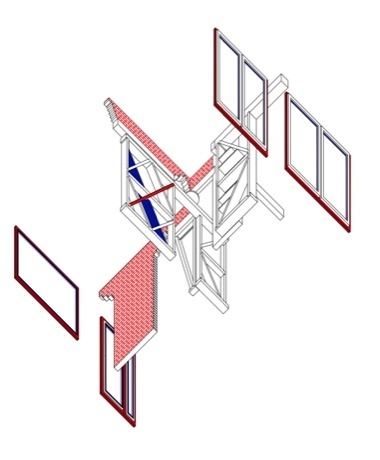 For this competition we are a team with Util Structuurstudies,Technum, Bureau Bas Smets, Doorzon Interieurarchitecten. Shortlisted for the invited competition for the PORTUS-SITE; we are looking forward to present a proposal in spring this year for the project called PORTUS GANDA . For this competition we are a team with evr-Architecten, De Smet Vermeulen architecten, Terp and Benoît Van Innis. 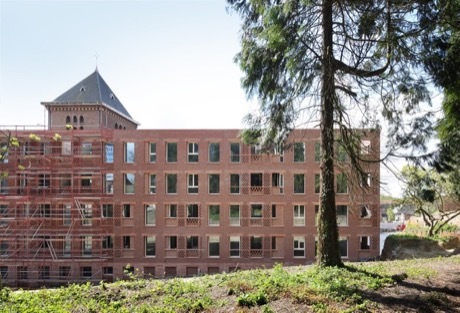 WIVINA opened its doors; Last weekend, 7th and 8th of March, the project in the former SINT-WIVINA monastery in GROOT-BIJGAARDEN was open for the future residents of the 65 luxury service flats. 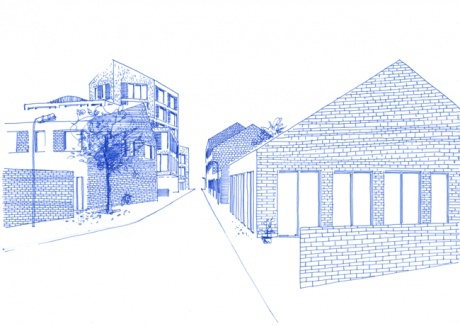 Piet en Ellen have been lecturing on their house at the SLOW FESTIVAL at the CONCERTGEBOUW Brugge on the invitation of Archipel vzw, concertgebouw Brugge 08/11/2014. 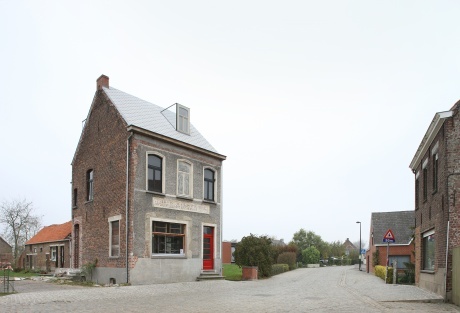 The EUROPEAN UNION PRIZE FOR CONTEMPORARY ARCHITECTURE - MIES VAN DER ROHE AWARD 2015 nominated the four houses MEULESTEDE TICHEL ARBED WARANDE designed for our dearest clients in the frame of the KAVEL PROJECT initiated by the independent city development company SOB GHENT. Nice to see those projects nominated in the row of earlier nominations for ROT-ELLEN-BERG, TWIGGY and LES BALLETS C de la B & LOD. And once again APRIL & BUS:STOP. We are happy to share with the village of KRUMBACH (AUSTRIA) and all those nice collegues the STAATSPREIS ARCHITECTUR 2014. Alexander Brodsky; Wang Shu AMATEUR ARCHITECTURE; Rintala-Eggertsson, Smiljan Radic, Suo Fujimoto en Anton Garcia Abril ENSEMBLE STUDIO. 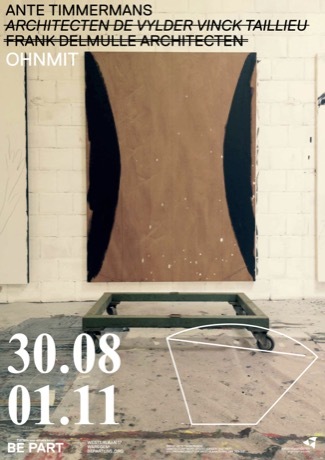 Invited by the curators Niels Olsen and Fredi Fischli in their group exhibition at LUMA WESTBAU ZURICH; presenting the first TRIPTYCH of a series of 3 x 7 TRIPTYCH's. 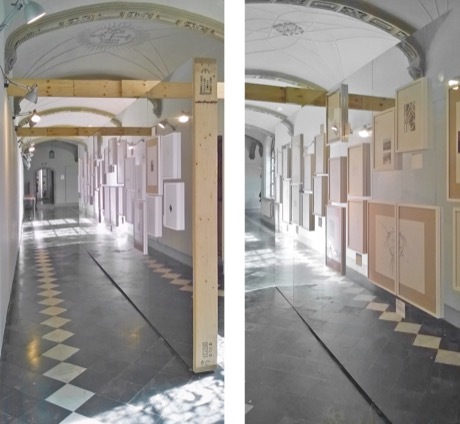 This first TRIPTYCH brings the work of Pieter de Bruyne DAY&NIGHT together with ODE PDB ( JIJ's - architecten de vylder vinck taillieu ) and GANZENDRIES (architecten de vylder vinck taillieu). A cupboard. A copy. A construction. 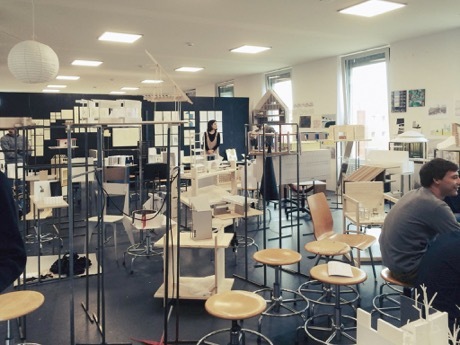 A collaboration of LUMA Foundation and gta exhibition ETH Zurich. Uri Aran, 6a architects, Andrea Branzi, Pieter de Bruyne, Studio Tom Emerson, Dan Graham, GRUPPE, Trix & Robert Haussmann, JIJ'S, Christian Kerez, William Leavitt, Made In, Joseph Luis Mateo, Mélanie Matrange, Helen Marten, Matthias Megyeri, peter Märkli, Claude Parent, Magali Reus, Cameron Rowland, Carissa Rodriguez, Stephan Tr¨by, Günther Vogt, architecten de vylder vinck taillieu, Peter Wächtler. Thanks to the Designmuseum Ghent. House Ganzendries has been photgraphed by Tom Lagast. Replacing the open by the structure and the structure by the open. Falling down the stones. Blue and Red. Wherefrom? Lecture is announced for 29 January at VITRA WEIL (CH) within the context of the AALTO YEAR at VITRA. 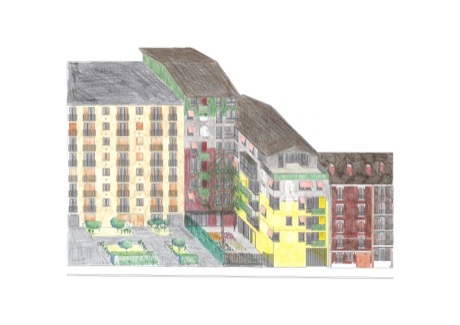 On tuesday 07/10/2014 the proposal for the competition, Lot F Paris18, in Paris has been handed in. We are looking back to a very nice and intense working together with BRUTHER (FR). 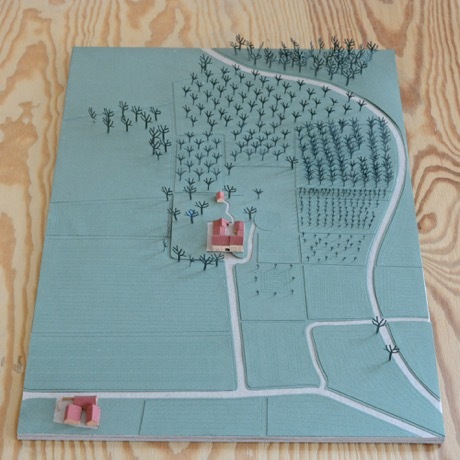 On Friday 24/10/2014 the proposal for the new building of the province of East-Flanders has been presented at the ATELIER BOUWMEESTER. 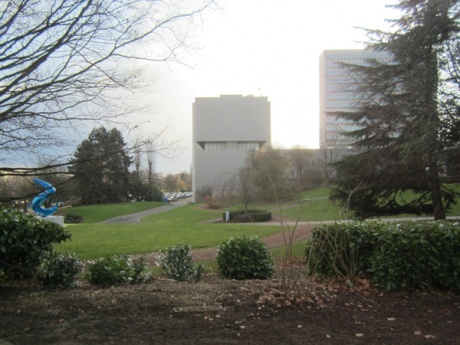 On Monday 01/12/2014 we will attend the first meeting at the VRT to start the competition. Handover expected march 2015. 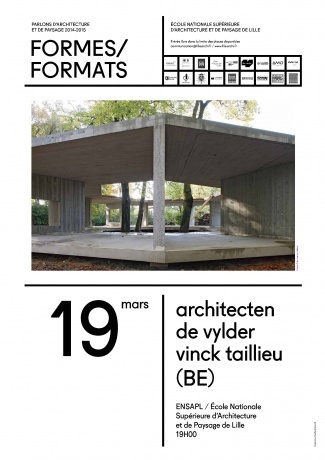 Lecture is announced for 19 March at ENSAP LILLE (FR) within the context of FORMES/FORMATS. 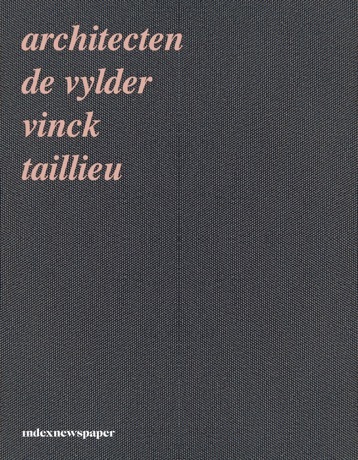 At Antiquarian BROCH in Antwerp is now 2G architecten de vylder vinck taillieu on sale but in a strange condition: each book has a written dedication to a certain person. That is what nice antiquarian books make them special. All those messages. René#Heyvaert# Sol#LeWitt# Sigurd#Lewerentz# sir#John#Soane# Constantin#Brancusi# Pieter#De#Bruyne#Georgia#O'Keeffe. As if they once got a copie. Antiquariaat BROCH, Grote Pieter Potstraat 13, 2000 Antwerpen. House VOS is finished. A really beautiful old house. But bourgeois. And now open. Open in its details. Open to the garden. Open in its details. Open where possible. House HUIK is there. From a complete house to half a house. 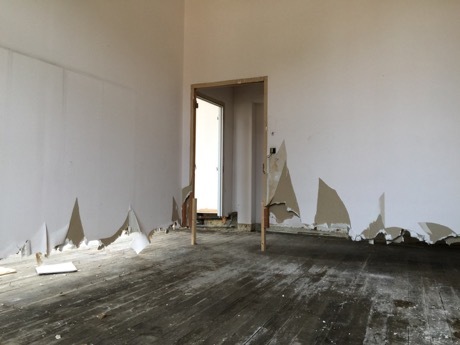 To become a completely different house. A house to live in. And to give a hearty welcome: guest rooms are part of living. House SANDERSWAL is there. From half a house to a complete house. A house with a roof bigger than the house. A kitchen outside the house. A rain well above ground. Still April. In May. That chapel. That bus:stop. There in Austria. Today also nominated for the Belgium steel price in the category civil construction. 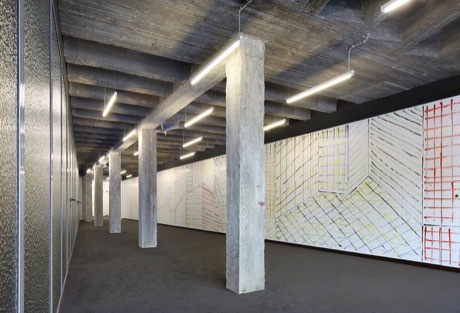 ATELIER BOUWMEESTER currently has an exhibition on architectural drawings. Cédric Libert made a selection. 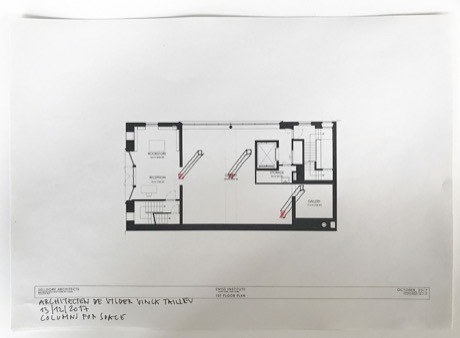 JEAN-CHRISTOPHE QUINTON; IDO AVISSAR LIST; 51N4E; SOU FUJIMOTO; SIMONA DENICOLAI & IVO PROVOOST; LUC DELEU & T.O.P OFFICE; NU ARCHITECTUURATELIER; BUREAU VERS PLUS DE BIEN ÊTRE / V+; SIMON BOUDVIN; XDGA. We are joining. We are also looking back at a SMALL TALK together with IDO AVISSAR hosted by LAURENT STALDER 26 June 2014. We are quite happy with the proposal presented within the context of the Open Oproep for the Frans Masereel Centrum under the shared title KASTERLEE MERTENS JANSEN MASEREEL / HALF COMPLETE SQUARE CIRCLE. Ambitious but small, big in modesty. 25th of April the first stone was laid, with champagne! This project in the former SINT-WIVINA monastery in GROOT-BIJGAARDEN is the second final piece of the plan for the whole site. The cross-formed building positions itself as the key in between park, existing monastery and garden wall. 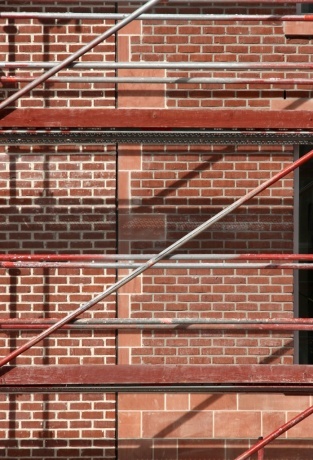 Each of the 65 luxury service flats will take their part within the perspective and the history. The first walls of the day care center KRAAKJE in UKKEL have come out of the ground! In the foreseeable future 53 children will experience this building as a house next to the church. House and church share the same graphic. 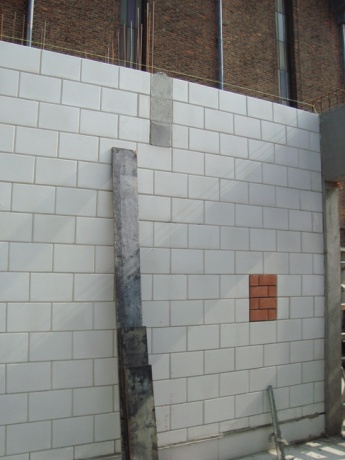 This project is the result of a candidacy initiated by the VLAAMS BOUWMEESTER. Construction of the services center and service flats for the OCMW Aarschot has reached its highest point! 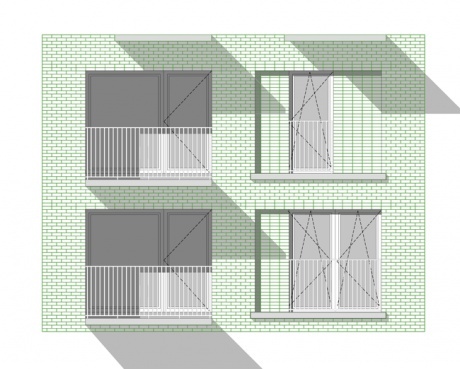 This project is the result of a competition within the context of the OPEN OPROEP of the VLAAMS BOUWMEESTER and was designed and prepared for execution together with DRDH ARCHITECTS from LONDON. The building application for Cadix D2 has been approved! 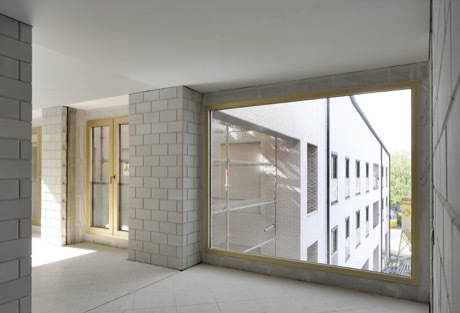 Construction of 32 sustainable apartments and commercial space in a building block with 108 apartments, offices and commercial space on 'het eilandje' in Antwerp. 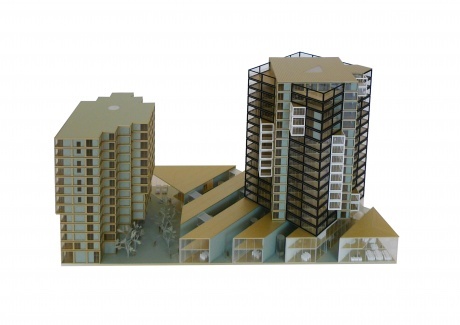 Competition in collaboration with Project², METAarchitecteuurburo, NoA architecten, OFFICE KGDVS and WEST 8. 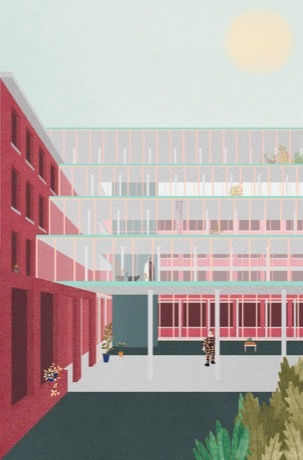 In the perspective of the PILOOTPROJECT ZORG - FUTURE CARE LIVING - driven by FLEMISH MINISTER OF WELFARE and the FLEMISH BOUWMEESTER the proposal DORP ZORG DIL PLEK STRAAT for DILBEEK has been won. We would like to thank the client and everyone who was involved to believe in our proposal DORP. 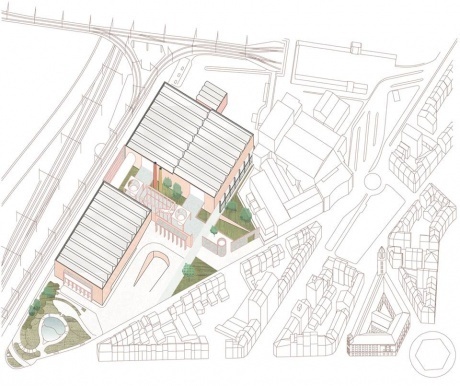 The proposal DORP ZORG PLEK STRAAT brings the assignment ZORG for DILBEEK on the scale of DORP and MENS. 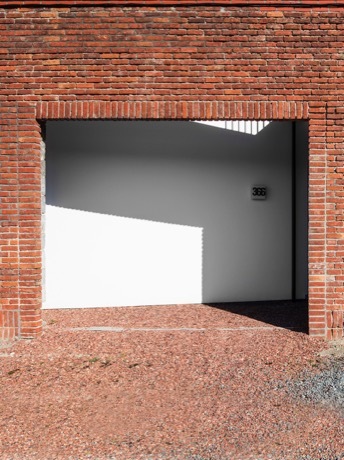 We are looking back to the STUDIO ARCHITECTEN DE VYLDER VINCK TAILLIEU at the ACCADEMIA DI ARCHITECTTURA DI MENDIRSIO (CH) past autumn 2013 with pleasure. The exercise 7 HOUSE 1 HOUSES framed within the context of BRUSSELS-OSTEND couldn’t be any different than discovering pleasure of working and imagining. Architecture can’t be different. The students were fantastic. We are already looking forward to the next STUDIO FALL 2014. 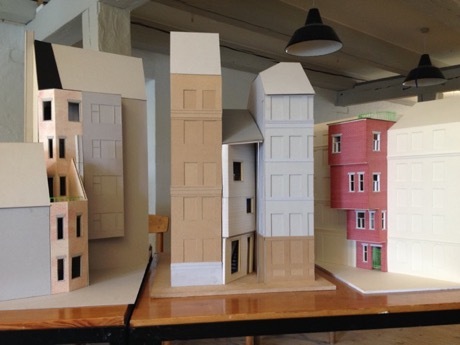 This summer we are making STUDIO ARCHITECTEN DE VYLDER VINCK TAILLIEU at the SUMMERSCHOOL PORTO ACADEMY 2014. With lots of others. Christian Kerez, Manuel Aires Mateus, Valerio Olgiati, Anton Garcia-Abril, Barbas Lopes, Cecilia Puga, Emilio Marin, José Paulo dos Santos, Kersten Geers, Nuno Valentim, Paulo Providência, Ryan W. Kennihan, Smiljan Radic, Tetsuo Kondo. We are looking forward to STUDIO ARCHITECTEN DE VYLDER VINCK TAILLIEU at the EPFL ENAC LAUSANNE next academic year 2014-2015. Maybe the house is in particular the façade. Maybe the façade is in particular the shop. The façade has its detail. A detail which is also an oriel. Several oriels. The shop gets his oriel. An oriel which is not looking outside but calling inside. An oriel which is maybe not different than the others except that the oriel is inversed. The rooms – today the shop - are now the scene; not the street which all other oriels want to see. Inside out. Sous-sol and bel-etage are next to the oriel and now together shop. And the shop is white. And the façade is white. Shining. More or less. The shop is a house with rooms. The house is the shop. It’s small. But then again big. The stairs make it big. Nathalie Vleeschouwer was looking for a shop. And found a house. 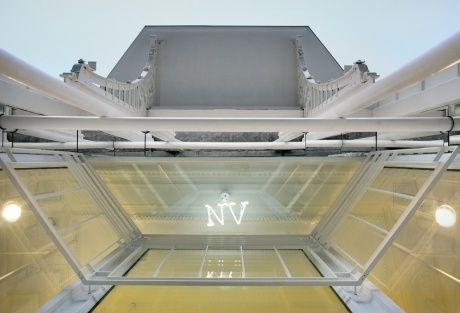 The shop of Nathalie Vleeschouwer is now a home. Ghent. Onderbergen. Nineteenth century. Nathalie Vleeschouwer. 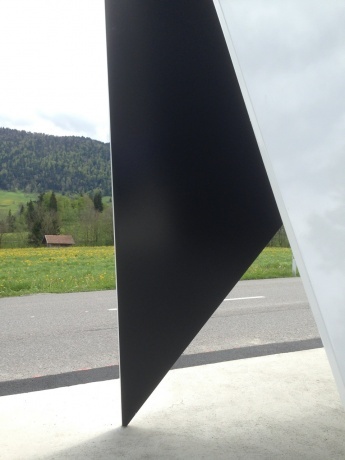 Whatever we call it – newsletter 01 -; in Krumbach they call it the chapel. The BUS:STOP is now open. Together with the BUS:STOP of all the others. 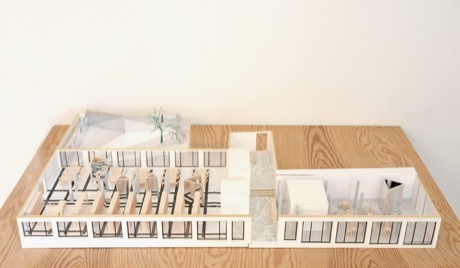 Alexander Brodsky, Wang Shu, Rintala-Eggertsson, Smiljan Radic, Sou Fujimoto and Antonia Garcia Abril. Krumbach. Austria. Your next stop. April as always. In May. That chapel. 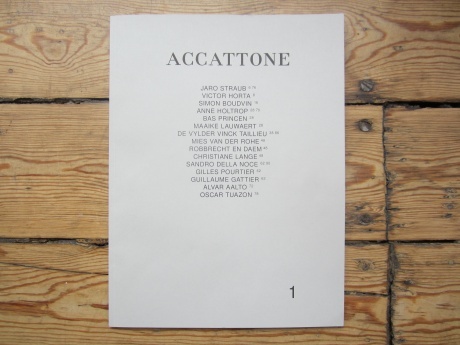 Taking part in the First edition of ACCATTONE. With a story of images of LE SAN GOTTARDO DOUBLE. A beautiful ACCATONE. Thank you ACCATONE. Together with Jaro Straub, Victor Horta, Simon Boudvin, Anne Holtrop, Bas Princen, Maaike Lauwaert, Mies Van Der Rohe, Robbrecht and Daem, Christiane Lange, Sandro Della Noce, Gilles Pourtier, Guillaume Gattier, Alvar Aalto, Oscar Tuazon. The municipal services center for the city of Ghent of Ledeberg – in the previous town hall of Ledeberg – is water- and windproof. 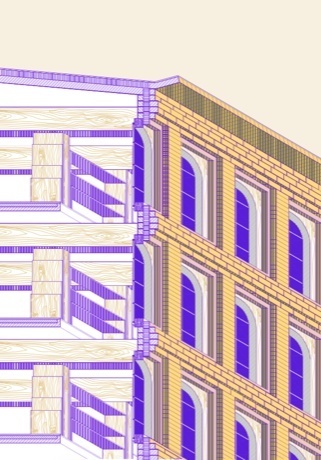 The renovation of the façade and the furnishment are going to start. Next year it can be fully used. The municipality and police department will take their post. But also the party hall; the wedding hall and the previous district court will give Ledeberg back what they had to wait for so long. It’s places for community work. From city theater to carnival. Lecture at the RICE School of Architecture, Houston, USA. architecten de vylder vinck taillieu takes part in the exhibition Linked: the collection is networking in Design Museum Gent. 14/11/2012 - for the 50th anniversary of Varese Institute of Architects. 08/11/2012 - House Rot-Ellen-Berg and Twiggy nominated! ...for the European Union Prize for Contemporary Architecture Mies van der Rohe Award 2013! ...for the Iakov Chernikhov International Prize! 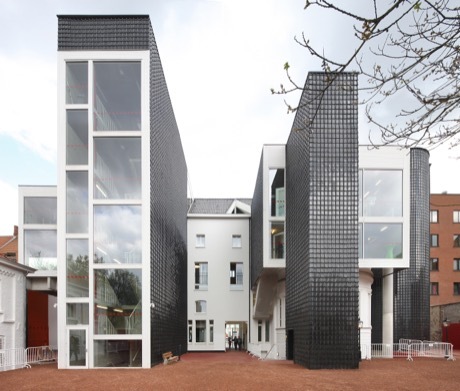 May 9th 2012, Ecole d’architecture de Bretagne / skol tisavouriezh breizh, Rennes, France. 11/04/2012 - Opening exhibition VAI Austria! 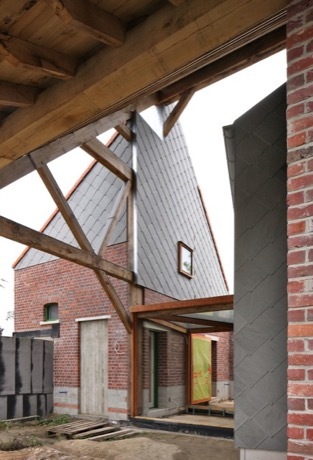 08/03/2012 - Woning bm wint Belgian Building Award! 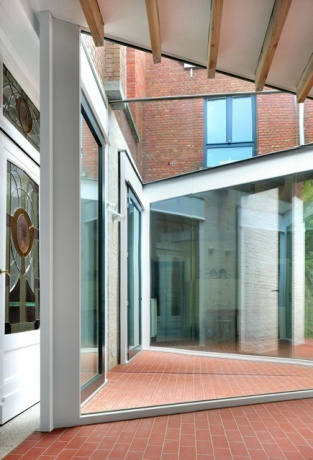 House bm wins Belgian Building Award for non-residential building! 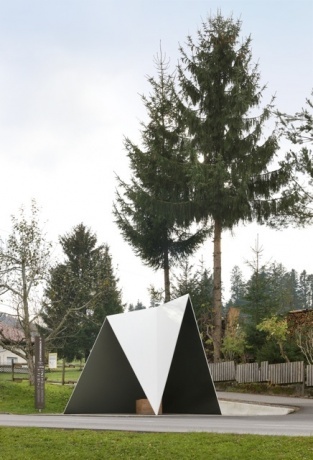 ...for the BSI Swiss Architectural Award. 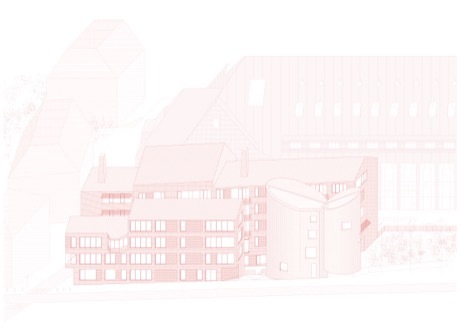 February 29th, 18:00h, Architectural Association School of Architecture, London. the ambition of the territory. 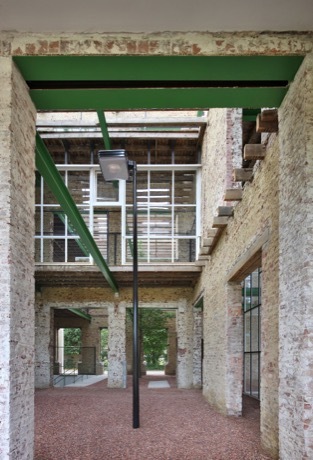 Studio Joost Grootens, GRAU and Ante Timmermans. It is yet a wonderful parcours; and the horizon looks even brighter! 05/01/2012 - Domus 954 out now! 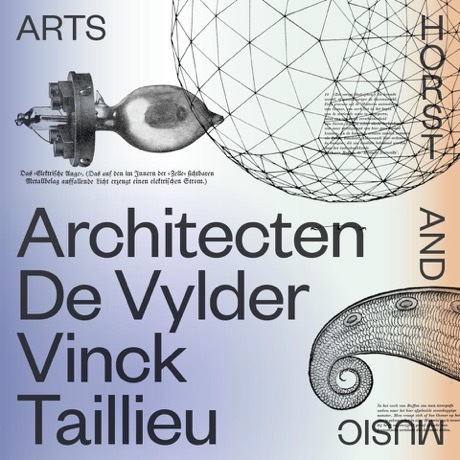 with publication and cover from architecten de vylder vinck taillieu!